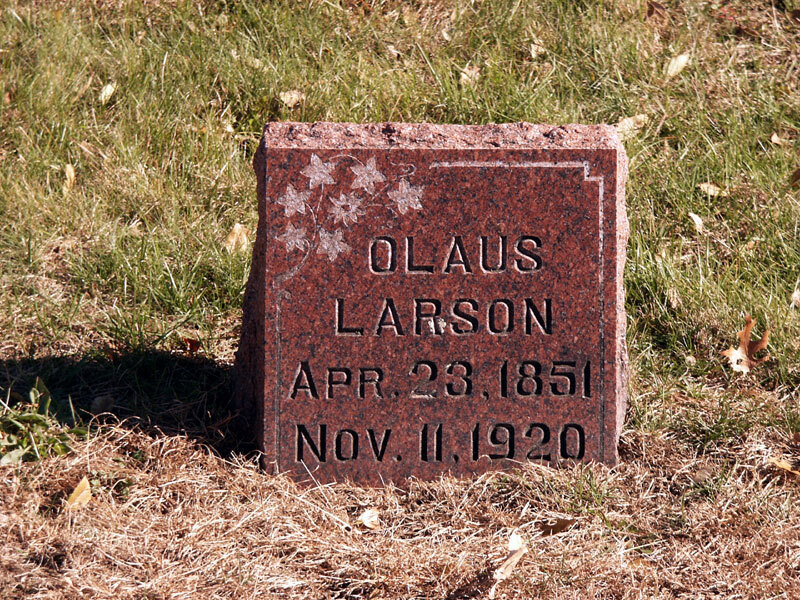 Olaus Larsson was born April 23, 1851, in Fröbbestorp, Torsås, Kalmar Co., Småland, Sweden, and died November 11, 1920, in Farmington Twp., Waupaca, WI, at age 69. Buried in Salem (Old Swede) Cemetery, Farmington Twp., Waupaca Co., WI. He is the son of Lars Pehrsson of Fröbbestorp, Torsas, Kalmar Co., Småland, Sweden, and Christina Olsdotter of Glosebo, Sweden. Catarina Olivia Wilhelmina Larsdotter was born January 25, 1848, in Varna Parish, Östergőtland Co., Sweden, and died August 6, 1906, in Farmington Twp., Waupaca Co., WI, at age 58. Buried in Salem (Old Swede) Cemetery, Farmington Twp., Waupaca Co., WI. She is the daughter of Lars Fredrik Nilsson of Grebo Parish, Östergőtland Co., Sweden, and Gustafva Wilhemina Ekman of Asby Parish, Linkőping District of Östergőtland Co., Sweden. 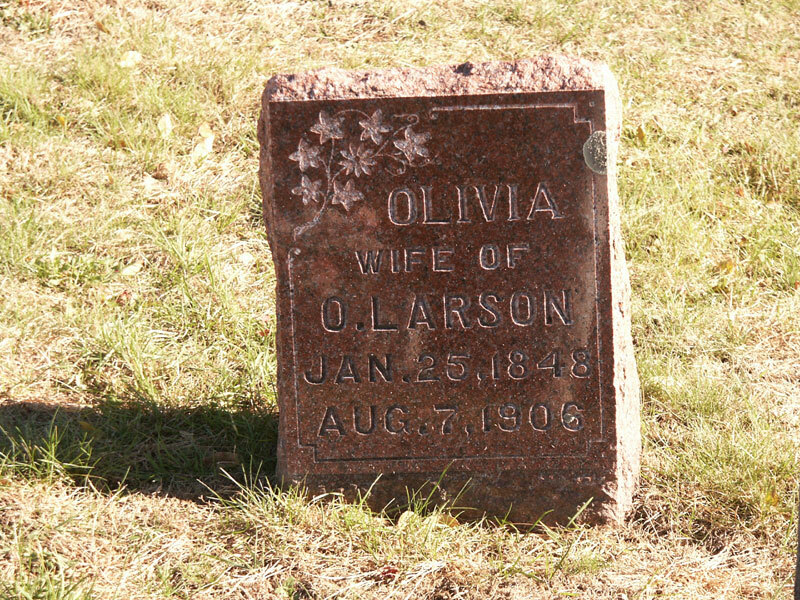 Olaus Larsson (age 23), a bachelor, and Catarina Olivia Wilhelmina Larsdotter (age 26), a maiden, were married August 13, 1874, in Marquette, Marquette Co., MI. Emilia Sophia Larson: Born December 22, 1875, in Marysville, Yuba Co., CA; Died Sunday, August 6, 1905, in Sheridan, Farmington Twp., Waupaca Co., WI (age 29). Buried in Salem (Old Swede) Cemetery, Farmington Twp., Waupaca Co., WI. Married October 24, 1894, at Salem Lutheran Church, Farmington Twp., Waupaca Co., WI, to Gustav Alfred "Fred" Johnson: Born November 4, 1870, in Sweden; Died November 16, 1950, in Waupaca, Waupaca Co., WI (age 80). Buried in Salem (Old Swede) Cemetery, Farmington Twp., Waupaca Co., WI. 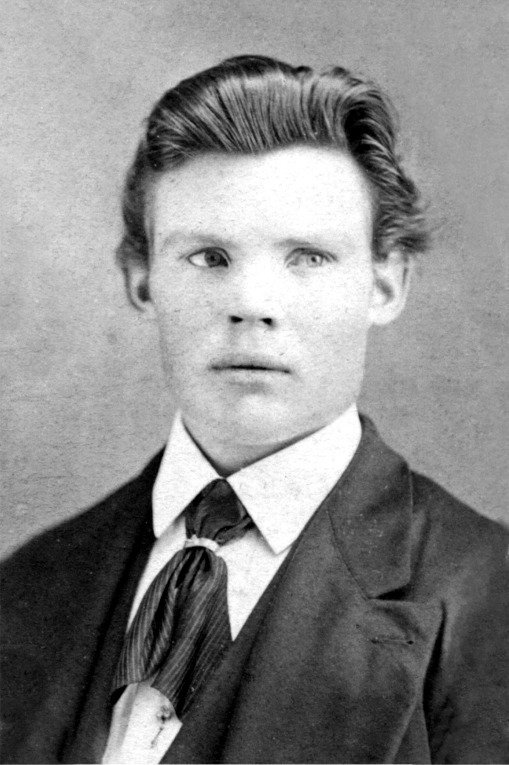 Oscar Emil Larson: Born July 18, 1878, in Marysville, Yuba Co., CA; Died July 21, 1893, in Farmington Twp., Waupaca Co., WI (age 15). Buried in Salem (Old Swede) Cemetery, Farmington Twp., Waupaca Co., WI. Arthur David Larson: Born January 21, 1881, in Farmington Twp., Waupaca Co., WI; Died January 16, 1968, at Riverside Community Memorial Hospital, Waupaca, Waupaca Co., WI (age 86). Buried in Salem (Old Swede) Cemetery, Farmington Twp., Waupaca Co., WI. Married (1) April 6, 1904, in Rockford, Winnebago Co., IL, to Norma Victoria Nelson: Born March 23, 1880, in Rockford, Winnebago Co., IL; Died Monday, May 8, 1933, at Community Hospital, Waupaca, Waupaca Co., WI (age 53). Buried in Salem (Old Swede) Cemetery, Farmington Twp., Waupaca Co., WI. Married (2) October 2, 1937, at the Arthur Larson residence near Sheridan, Farmington Twp., Waupaca Co., WI, to Caroline Barbara (Schnacky) (Wetherbee) Vedner: Born February 16, 1891, in Barron Co., WI; Died March 2, 1983, in Minneapolis, Hennepin Co., MN (age 92). Buried in Saint Josephs Cemetery, Rice Lake, Barron Co., WI. Divorced. Edith Christina Larson: Born February 8, 1883, in Farmington Twp., Waupaca Co., WI; Died November 5, 1971, at the State Veteran's Home Infirmary, Hot Springs, Fall River Co., SD (age 88). Buried in State Veterans Home Cemetery, Hot Springs, Fall River Co., SD. Married April 15, 1900, at the Salem Lutheran Church, Farmington Twp., Waupaca Co., WI, to Clarence Cornelius Nelson: Born January 1, 1879, in Rockford, Winnebago Co., IL; Died May 28, 1967, May 28, 1967, at a local hospital, Hot Springs, Fall River Co., SD (age 88). Buried in State Veterans Home Cemetery, Hot Springs, Fall River Co., SD. Almo Joshua Larson: Born June 29, 1885, in Farmington Twp., Waupaca Co., WI; Died November 19, 1962, in Farmington Twp., Waupaca Co., WI (age 77). Buried in Salem (Old Swede) Cemetery, Farmington Twp., Waupaca Co., WI. Married September 6, 1911, at Wesley Methodist Church, Spokane, Spokane Co., WA, to Emma Jane Abbey: Born February 22, 1884, in Orion Twp., Richland Co., WI; Died March 31, 1985, at Pine Ridge Manor, Waupaca, Waupaca Co., WI (age 101). Buried in Salem (Old Swede) Cemetery, Farmington Twp., Waupaca Co., WI. Freeda Wilhelmina Larson: Born September 30, 1891, in Farmington Twp., Waupaca Co., WI; Died December 5, 1991, at Wilson Health Care Center, Gaithersburg, Montgomery Co., MD (age 100). Buried in Arlington National Cemetery, Arlington Co., VA. Married June 25, 1919, in Chicago, Cook Co., IL, to Robert Ash Lewis: Born October 23, 1891, in Ramona, Lake Co., Dakota Territory (SD); Died February 21, 1973, in Washington, DC (age 81). 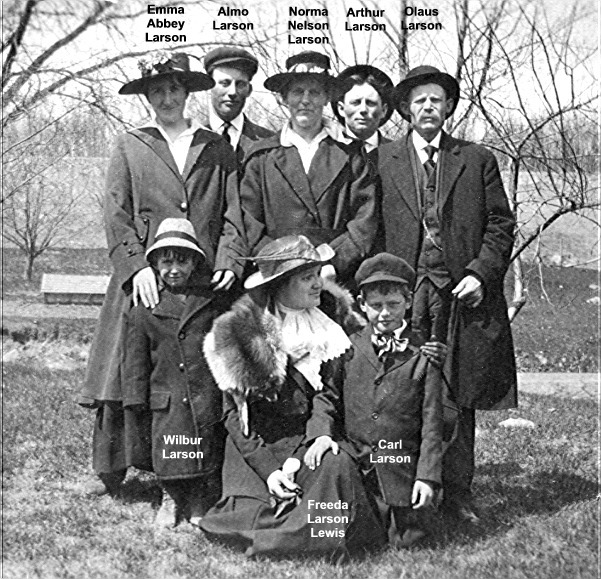 Buried in Arlington National Cemetery, Arlington Co., VA.
From Left to Right: Emma (Abbey) Larson; Wilbur Larson; Almo Larson; The Farm Dog; Norma (Nelson) Larson; Arthur Larson; Carl Larson; Mrs. Emil Nelson, and Mildred Wilson, at the Larson farm, ca 1915. From Left to Right: Emma (Abbey) Larson; Wilbur Larson; Almo Larson; Norma (Nelson) Larson; Freeda (Larson) Lewis; Arthur Larson; Olaus Larson; and Carl Larson, at the Larson farm, ca 1916. 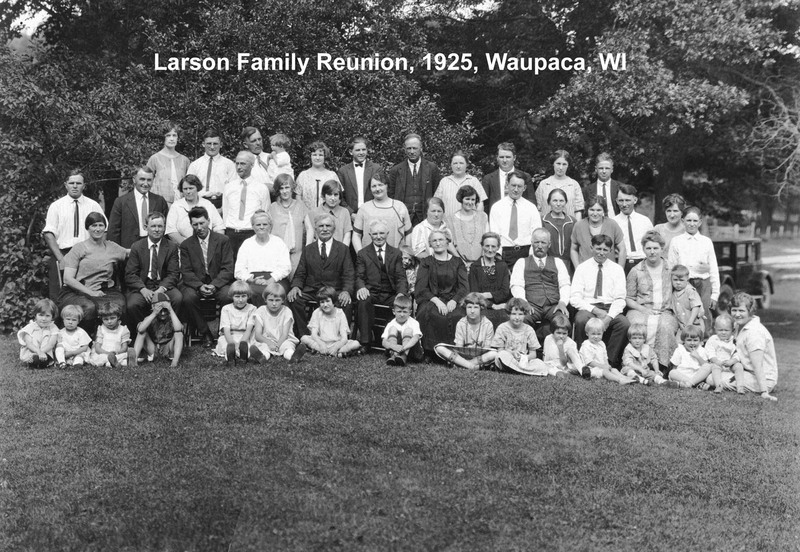 The Olaus Larson remaining family, except for Christine (Larson) Nelson, Farmington Twp., Waupaca Co., WI, about 1918. Olaus, Almo and Wilbur Larson at the Larson farm, about 1920. 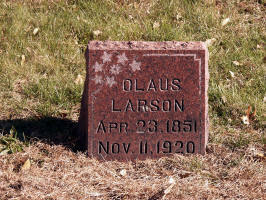 This is the last known picture of Olaus Larson, who died November 11, 1920. 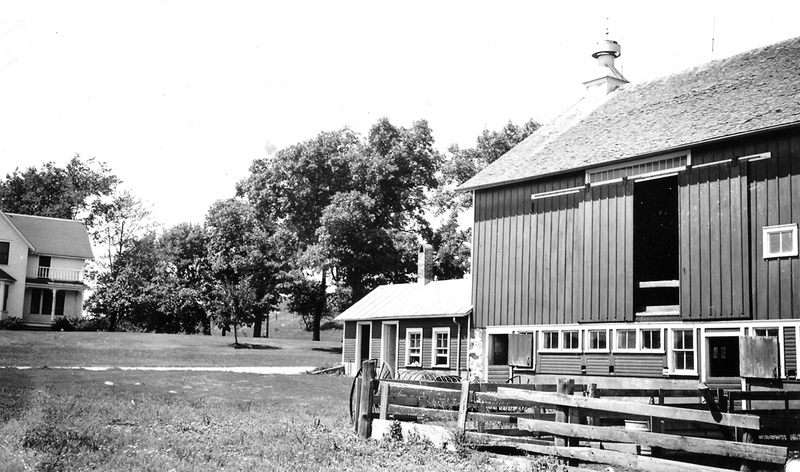 Larson farm, Rear of House, before Bathroom installation, about 1935. 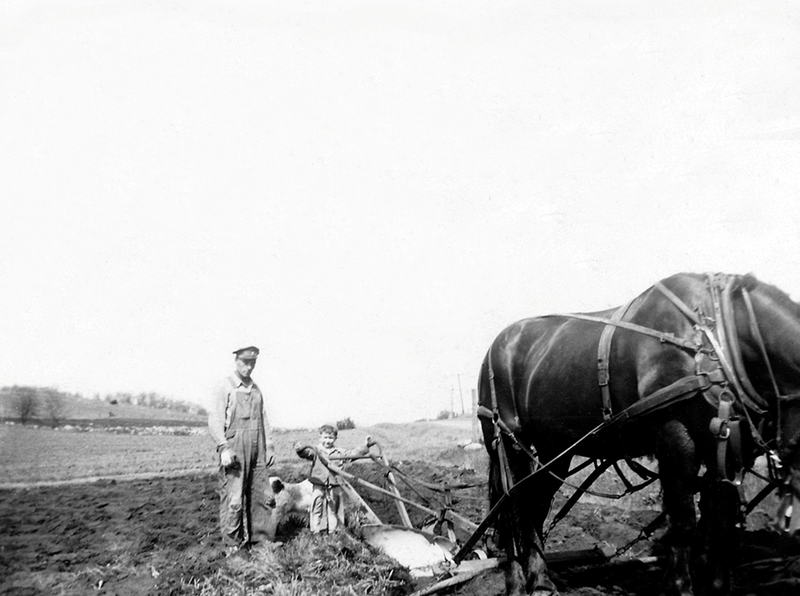 Larson farm, Joe Kunz with a horse and plow, May, 1944. 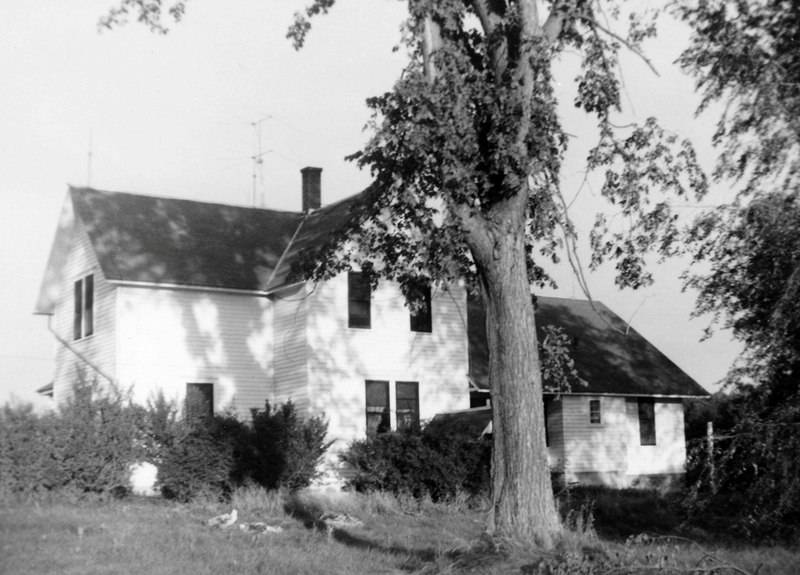 Larson farm, House Rear After Bath, about 1950. Larson farm, Joe and Ruth Kunz on a hay wagon, about 1950. 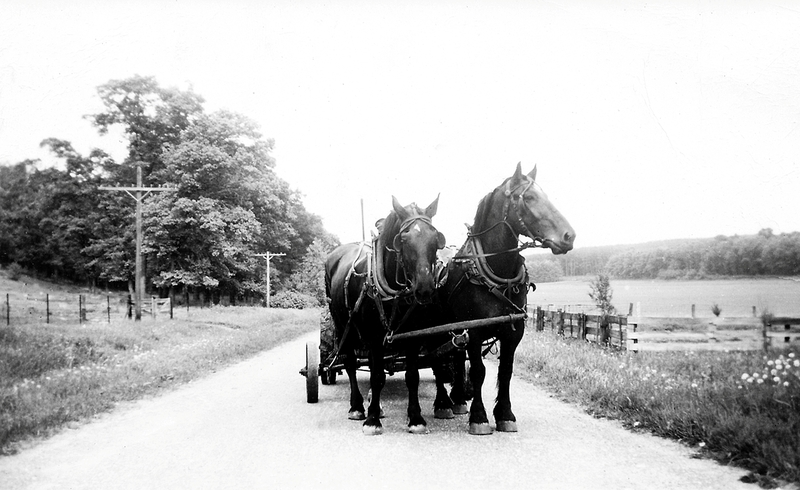 Larson farm, Almo Larson with horses Nell and Tom, pulling a manure spreader, about 1950. 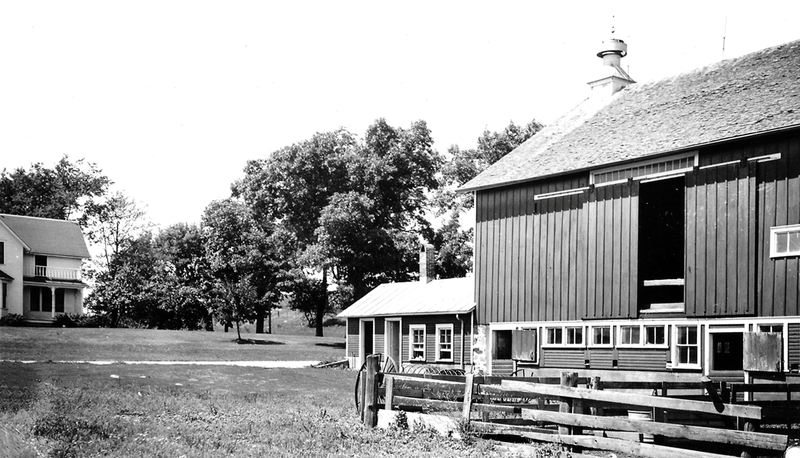 Larson farm, Almo with a manure spreader, about 1950. 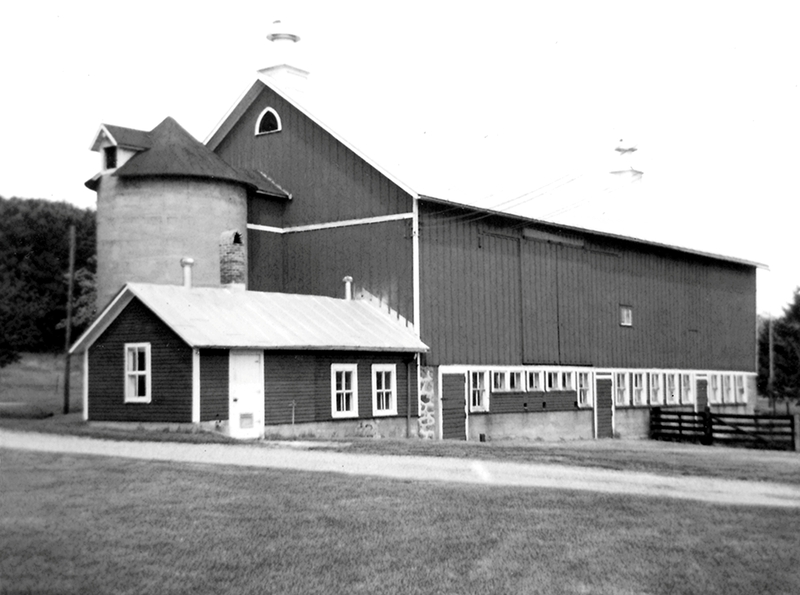 The former Larson farm in Farmington Twp., Waupaca Co., WI, about 1960. The former Larson farm in Farmington Twp., Waupaca Co., WI, about 2015. 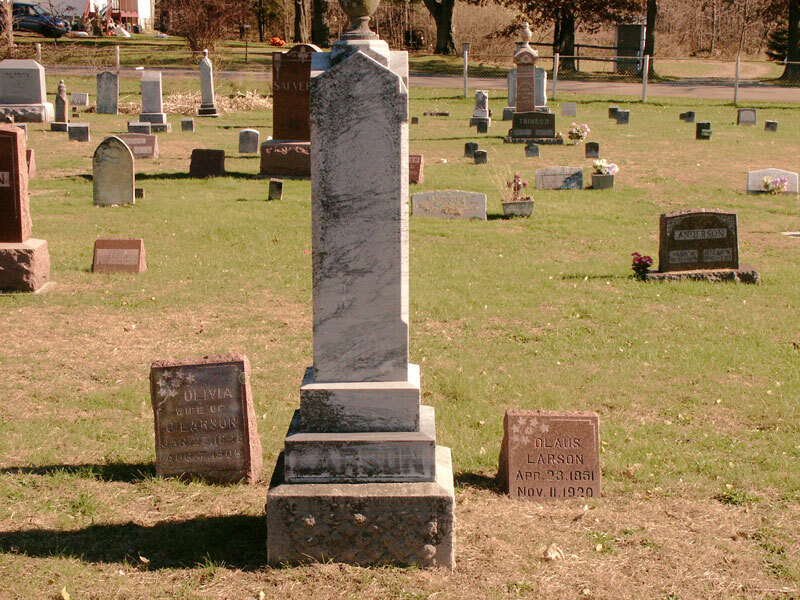 Olaus Larsson and Catarina Olivia Wilhelmina (Larsdotter) Larson are buried in Salem (Old Swede) Cemetery, Farmington Twp., Waupaca Co., WI. Catarina Olivia Wilhelmina Larsdotter was born January 25, 1848, in Varna Parish, Östergőtland Co., Sweden. Olaus Larsson was born April 23, 1851, in Fröbbestorp, Torsas, Kalmar Co., Småland, Sweden. Olaus Larsson arrived at the Port of Chicago, IL, in June, 1872. 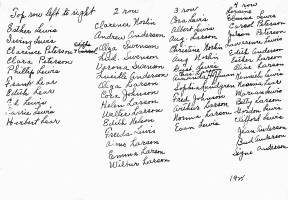 On February 23, 1874, Olaus Larsson declared his intention to become a US citizen. On June 16, 1890, Olaus Larsson took his oath of citizenship. 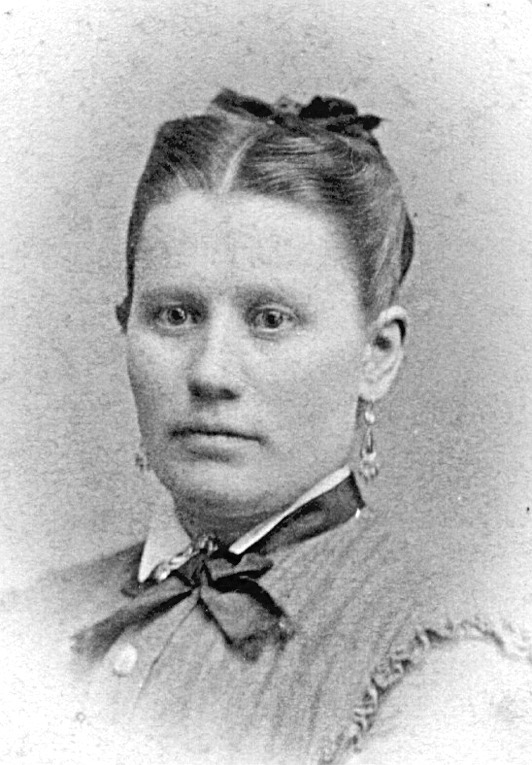 Catarina Olivia Wilhelmina Larsdotter immigrated to the United States in 1873 with a Swedish family who settled in Marquette, MI. She was a governess for their two boys. The Marriage Report for Marquette Co., MI, shows Olof Lorson (age 23) born in Sweden, a Laborer, and Olines Lorson (age 21) born in Sweden, were married August 13, 1874, in Marquette, Marquette Co., MI, by A. Walgreen, Minister. Witnesses were Carol Hagelstrom and J. Johanson, both of Marquette. 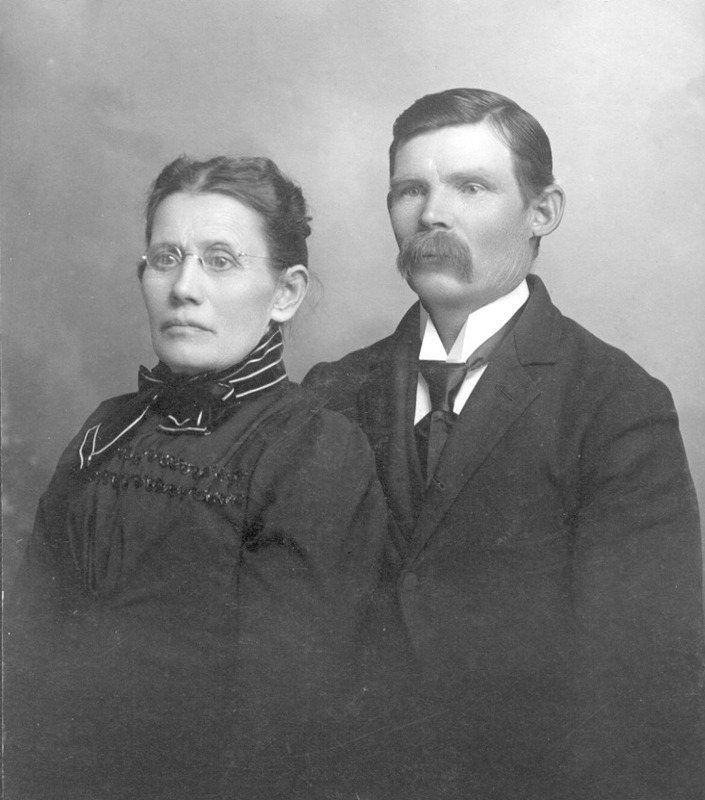 Olaus and Catarina Larson moved near Marysville, Yuba Co., CA, in 1875, where Olaus worked as a farm manager, but they returned to Waupaca, WI, in 1880 when hard times came. 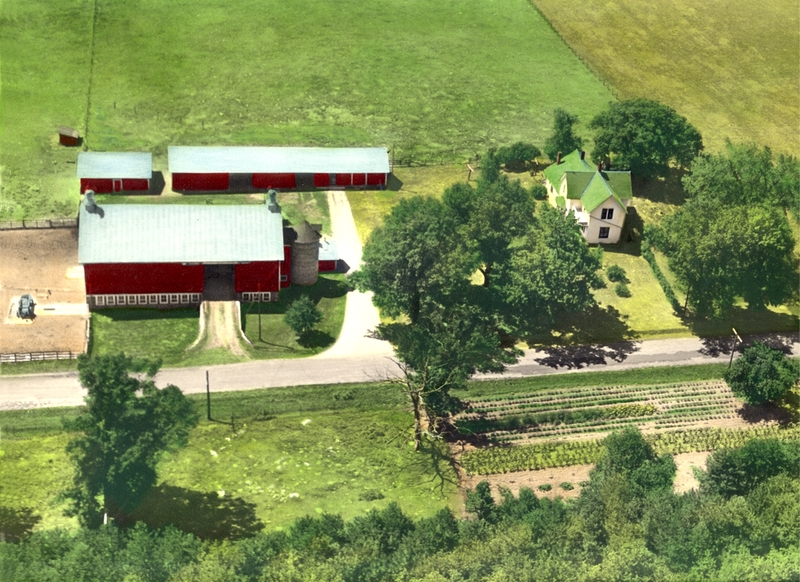 They purchased an existing 80 acre farm in Farmington Township, and homesteaded another 40 acres. Olaus about age 22, and Olivia about age 25. Olaus and Catarina c. 1900, and Olaus c. 1915. In 1899, Olaus staked a Homestead Claim for 40 acres of land adjacent to his farm. Accession Number W13690_.176 Wisconsin Volume 3690, Page 176, Document Number 3768. Land Office was Wausau. Aliquot Part Reference NWSW, Meridian/Survey Area: Fourth Principal Meridian; Miscellaneous Document No. 6569. The Act/Treaty authorizing the sale: Homestead Entry. Date signed: April 22, 1899. 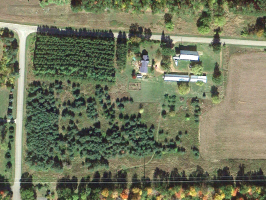 Acreage: 40. The Bureau of Land Management contains a signature. 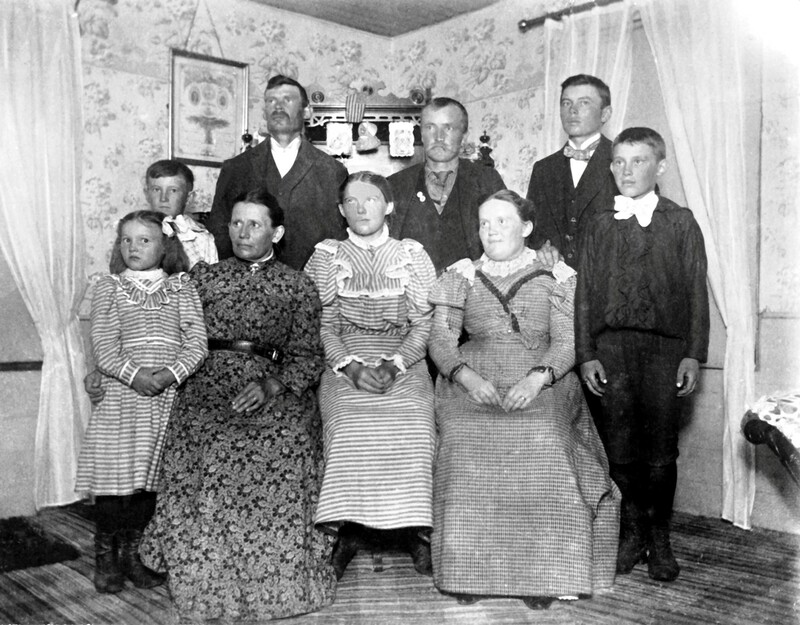 The Olaus Larson family, Waupaca Co., WI, about 1890. 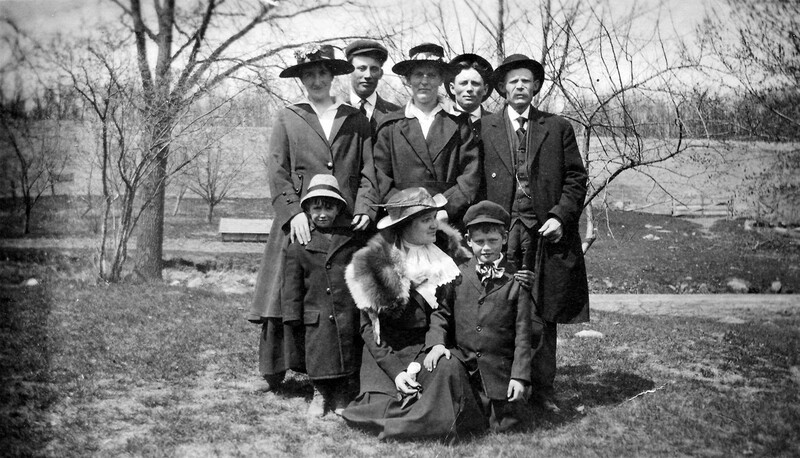 The Olaus Larson family, Farmington Twp., Waupaca Co., WI, about 1897. 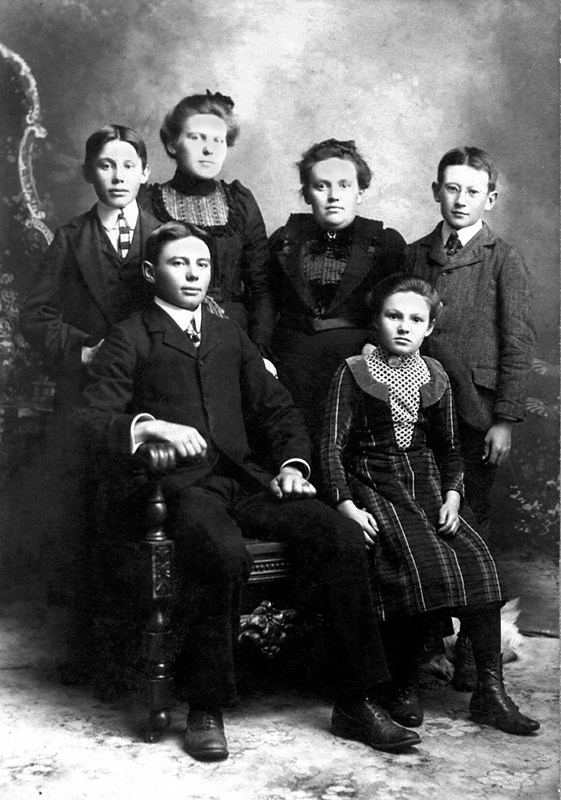 The Olaus Larson children, Waupaca Co., WI, about 1901. 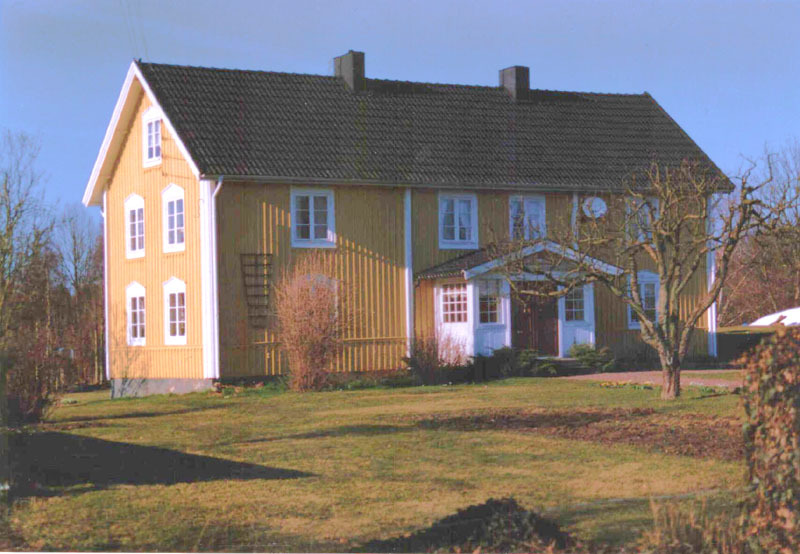 The house where Olaus Larsson was born. Located in the village of Fröbbestorp, situated south of Torsås, Sweden (population about 7,000). 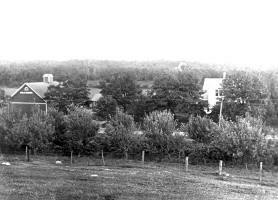 The village consists of four farms. Please note the similar architecture to the house Olaus and his brother Gustav Larson Lewis built in Wisconsin. Hi, Leigh Larson! I've found the picture of the house where your great-grandfather Olaus Larson was born in. 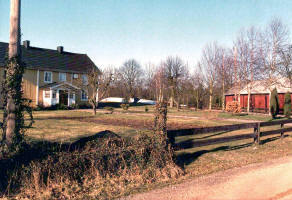 The village name is Fröbbestorp, situated south of Torsås (population around 7000), and consists of four farms. 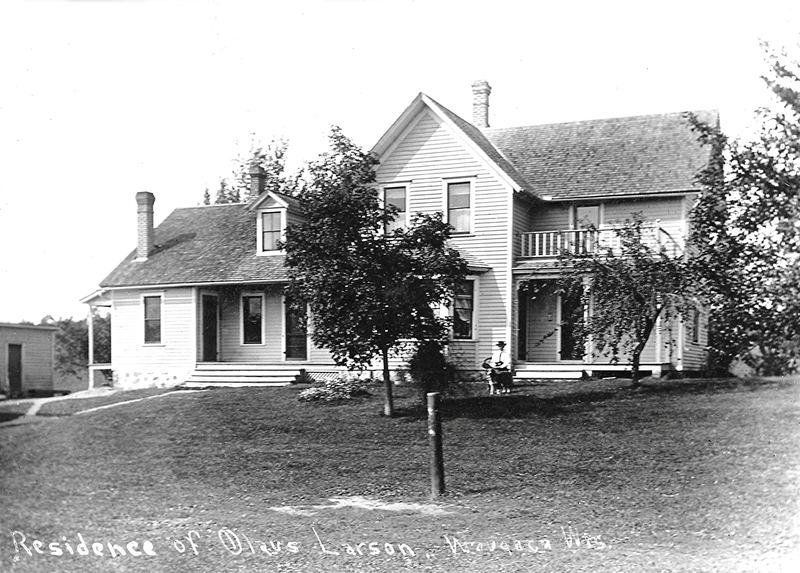 I am not sure whether the house looked like it looks today on the day when Olaus Larson was born. Probably, since it was 1851 it may has changed a little bit. But you will get an idea who it looks today. 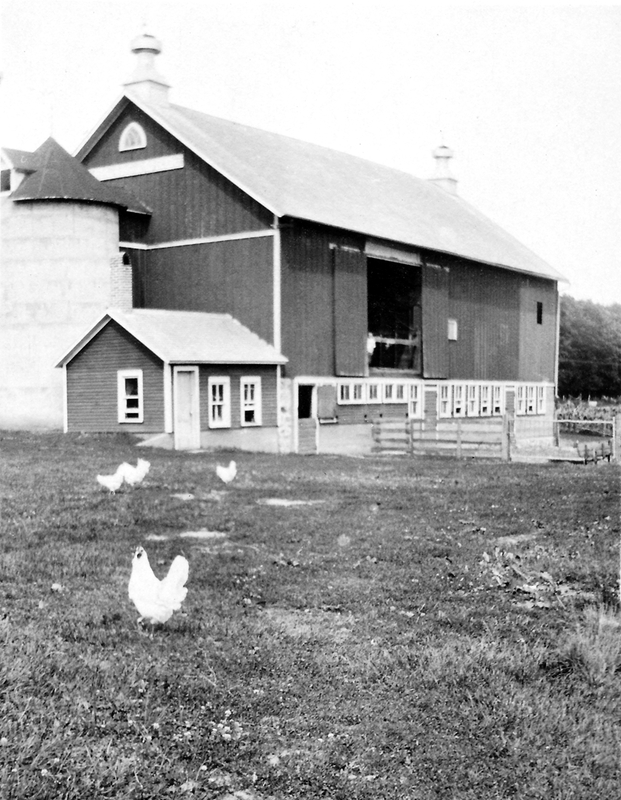 I shall say something about the history of the farm. Our first relatives, Per Andersson and his wife Maria Nilsdotter came to Fröbbestorp in 1691. When Per Andersson died in 1722, the farm was taken over by one of his sons, Anders Persson (1707-1785). Anders Persson's got several children, two of them; Per Andersson (1738-1790) and Lars Andersson (1746-1798) stayed in Fröbbestorp. 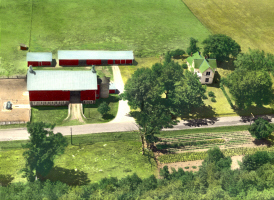 The farm was split in to two pieces. One piece to Per Andersson and the other piece to Lars Andersson. Per Anderssons was succeced by his daughter and his son-in-law. When they get too old to work, they were succeed of the son Nils Olofsson (1811-1879). His offsprings still owns the farm. Lars Andersson married Ingrid Nilsdotter (1754-1823). They've got many children. 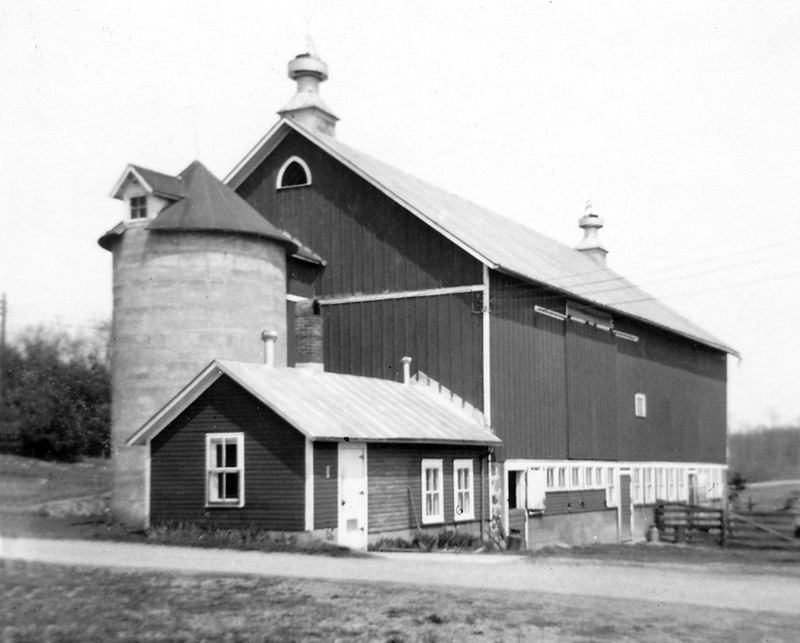 The oldest son, Petter (Sometimes he used the name, Per) Larsson, (1779-1821), took over the farm. He died only 42 years old, and his widow remarriage Sven Larsson. 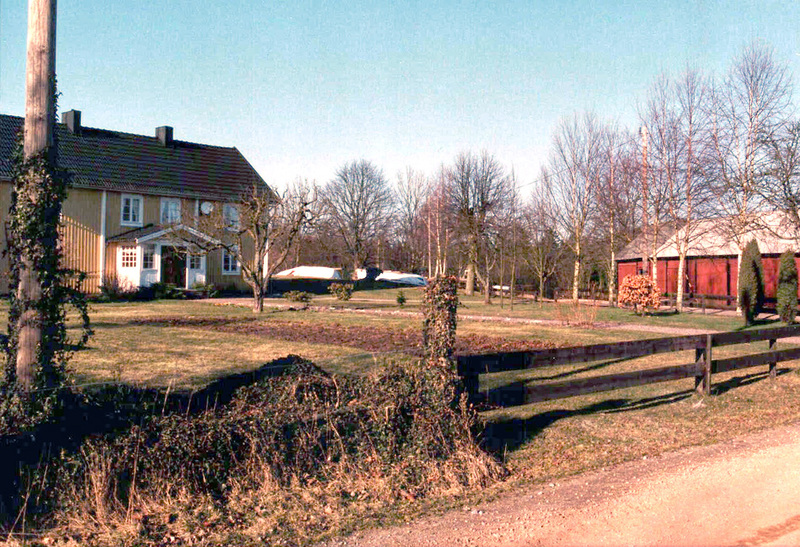 While waiting for the oldest son of Petter Larsson, Lars Pehrsson, Sven and Gertrud (Petter's widow) owned the farm. But when Lars Pehrsson became adult, he took over the farm and Sven and Gertrud moved out from Fröbbestorp. In 1832 Lars Pehrsson married Christina Olsdotter and the year after their daughter Ingrid was born. Together Lars and Christina got eight children. In 1856 Christina Olsdotter died, and Lars Pehrsson, now 50 years old, remarried Maria Månsdotter, age 35. Lars and Maria got four children. The last child, Ingrid Larsdotter, was my greatgrandmother. When Lars and Maria became old, Lars' son Magnus Larsson (who had been away for some years) returned home to take over the farm. I can't give you an exact date, but in the 1870's. It was a turbulent time in the family. Many of the children moved out from the home, as far as US. Ingrid, Peter and Andreas had already build their own families. Peter Larsson, who had studied, took the name Fröberg and worked in the Swedish Navy. 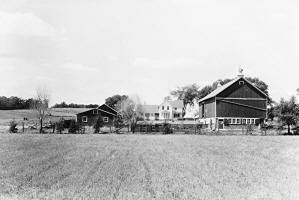 Andreas Larsson owned a farm not far from Fröbbestorp. Abraham Larsson might have commited suicide in 1871. 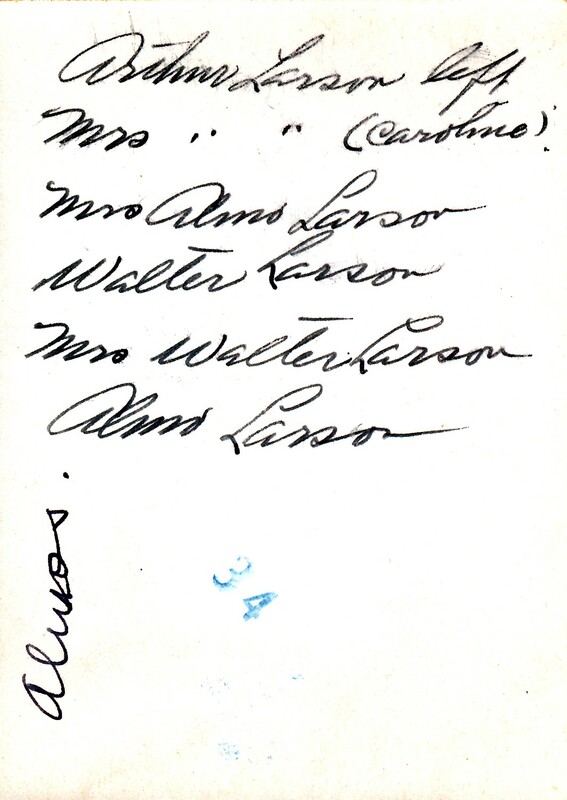 Gustaf Larsson seems to be immigrated to US in 1872 together with Olaus Larsson. But before the immigration Olaus Larsson worked as a sailor. The year after, late 1873, Erik Larsson came to USA, and in 1879 the youngest brother Sven Larsson travelled to California, USA. But he didn't stay for long. He returned home to Sweden in 1880 and got married, settled down and worked as a farmer. But for some reason he didn't stay long in Sweden neither. 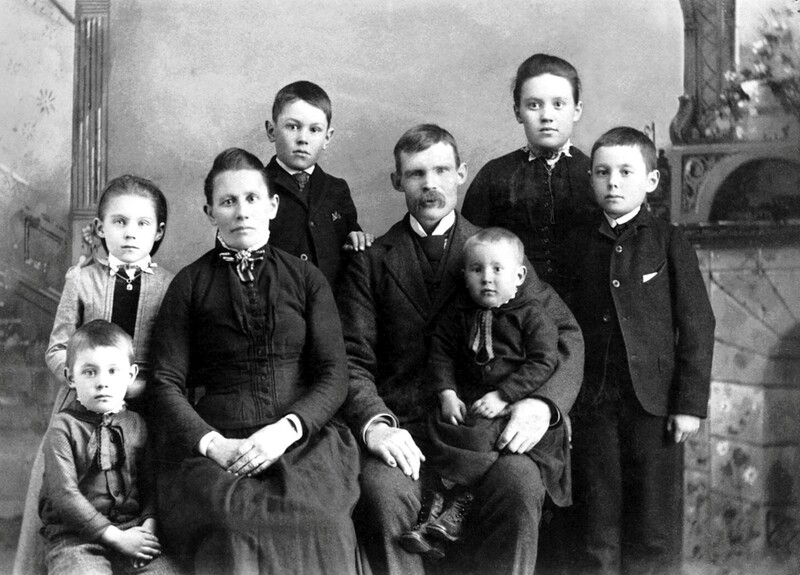 With wife and two children he went back to US, around 1887, and finally settled down in Miles City, where he worked at the railway [Velma Fraley]. Probably this was one reason for my grandfather's brother Karl Svensson to settle down in Miles city. Where he also worked at the railway. In Fröbbestorp, Magnus Larsson was succeed by his son Karl Oskar Magnusson (b.1874). But he was the last relative in a direct line from Per Andersson (who bought the farm in 1691) to cultivate the farm. Two of his children became farmers in another village, another son worked as a taxi driver and the daughter (who is still alive) owned a motel. But this is not the end of the story, because several years later an another relative came back and cultivate the farm. It was an offspring to Maria Larsdotter (b.1786) - sister to Petter Larsson, whose name is Bertil Johansson. 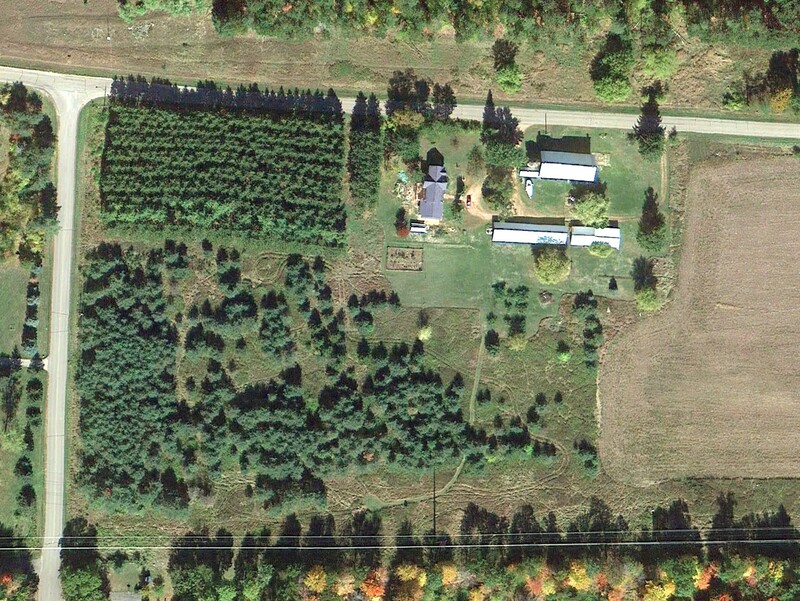 So today there are still two farms in Fröbbestorp owned by relatives. 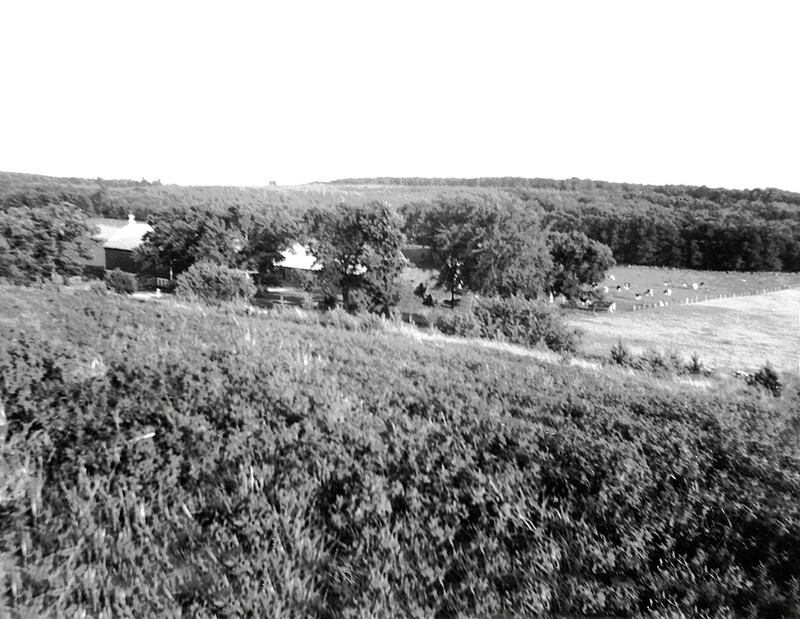 The farm where Per Andersson (1738-1790) owned and the one Lars Andersson owned. In 1868, Catarina left Grebo Parish and removed to the Kongsvikstorp area of Varna Parish. In 1872, Catarina removed to Bersbo Grufna, also in Varna Parish. In June, 1872, Olaus emigrated to the USA from Sweden and arrived at the Port of Chicago, IL. On May 5, 1873, Catarina left Varna Parish for the USA. She was the 75th person to depart Varna Parish in 1873. Her Swedish designation was "piga," for being unmarried. She became governess for a Swedish family in Marquette, MI. She took the last name of Larson. 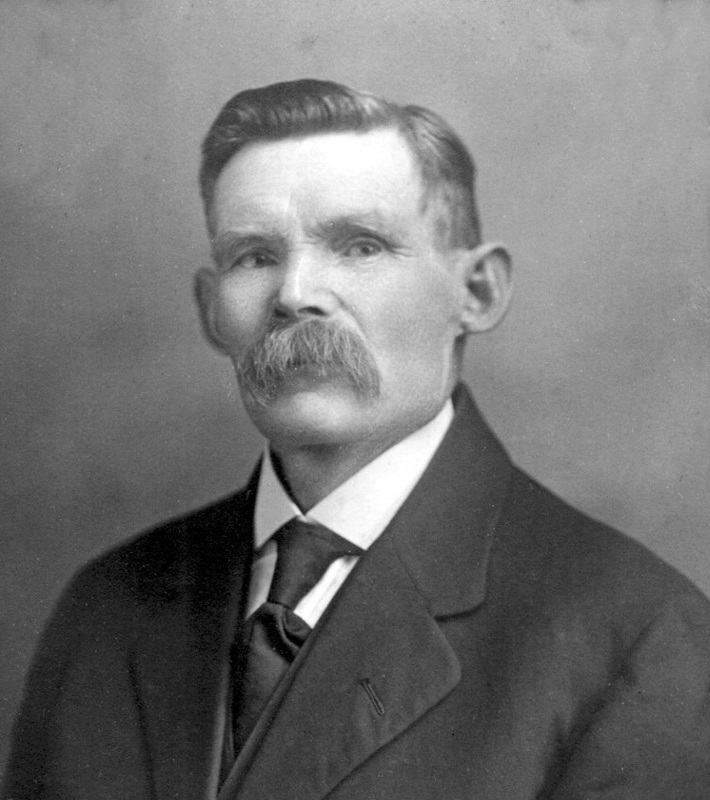 On February 23, 1874, Olaus Larson declared his intention to become a U. S. citizen. 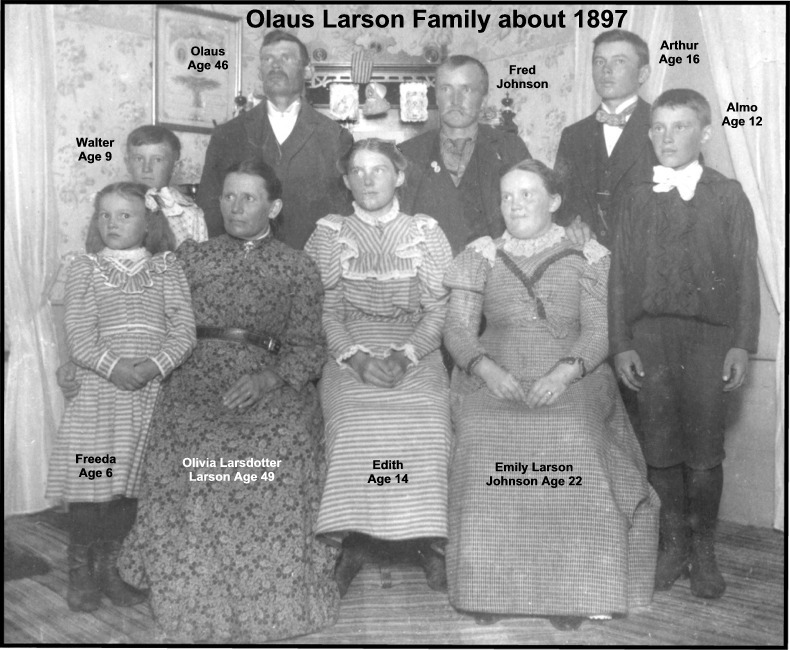 The 1880 U. S. Census taken on June 10, 1880, shows Olaus Larsson (age 29) born in Sweden to Swedish-born parents, is a married Laborer, and is living in South Putah Precinct, Putah Twp., Yolo Co., CA. Living with him are: Catrina O. Larsson (age 31) born in Sweden to Swedish-born parents, a married House Keeper; his daughter, Emily S. Larsson (age 4) born in California to Swedish-born parents; and his son, Oscar A. Larsson (age 1) born in California to Swedish-born parents. Three laborers are also living in the household. The 1880 U. S. Census taken on June 11, 1880, shows Mary Hunt (age 49) listed as the owner of land in Farmington Twp., Waupaca Co., WI. She was born in Germany and is living alone. 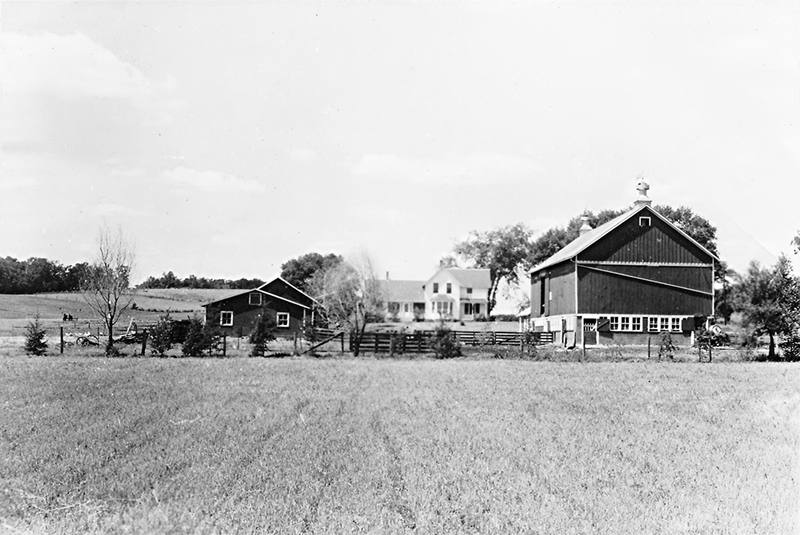 This is the farm that Olaus Larson purchased that year or the next. The 1885 Wisconsin State Census taken on June 20, 1885, shows Olaaus Larson is living in Farmington Twp., Waupaca Co., WI. There are 3 Males and 3 Females living in the household, with 4 having been born in the United States and 2 of Scandinavian birth. 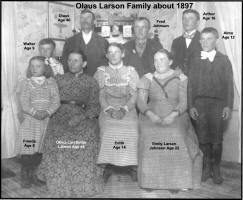 On June 16, 1890, Olaus Larson took his oath of citizenship and became a naturalized citizen. The 1895 Wisconsin State Census taken on June 20, 1895, shows Olaus Larson is living in Farmington Twp., Waupaca Co., WI. There are 7 Males and 3 Females living in the household, with 8 having been born in the United States and 2 of Scandinavian birth. Emilia Sophia "Emily" (Larson) Johnson died August 6, 1905, in Sheridan, Farmington Twp., Waupaca Co, WI, at age 29. Buried in Salem (Old Swede) Cemetery, Farmington Twp., Waupaca Co., WI. 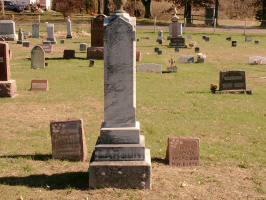 Catarina Olivia Wilhelmina (Larsdotter) Larson died August 6, 1906, in Farmington Twp., Waupaca Co., WI, at age 58. Buried in Salem (Old Swede) Cemetery, Farmington Twp., Waupaca Co., WI. 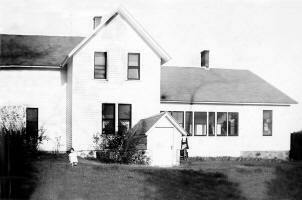 Mrs. Olaus Larson died at her home in the Town of Farmington Tuesday, Aug. 7th from a paralytic attack. She was born in Sweden the 25th day of Jan. 1848 and came to this country in 1873. 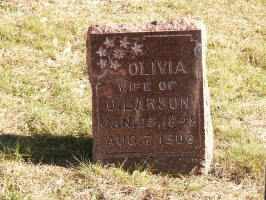 In 1874 she was married to Olaus Larson who still survives her. The same year they moved to California where they resided for six years. 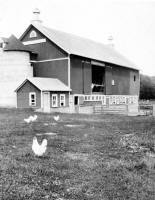 In 1880 they came to Waupaca and settled on a farm where they still reside. Their union was made happy by the birth of seven children, four boys and three girls, Mrs. G. A. Johnson who died in August 1905, Emil who died in 1893, Arthur who resides on a farm near Sheridan, Mrs. C. C. Nelson who lives in South Dakota, Almo a graduate of Waupaca High School in 1904 and Walter and Freeda members of the High School who are all staying at home. Beside her family she is survived by two brothers and two sisters. She had always lived a true Christian life and taken an active part in church work. Her last and departing words were "Jesus is my Friend the best one", etc. 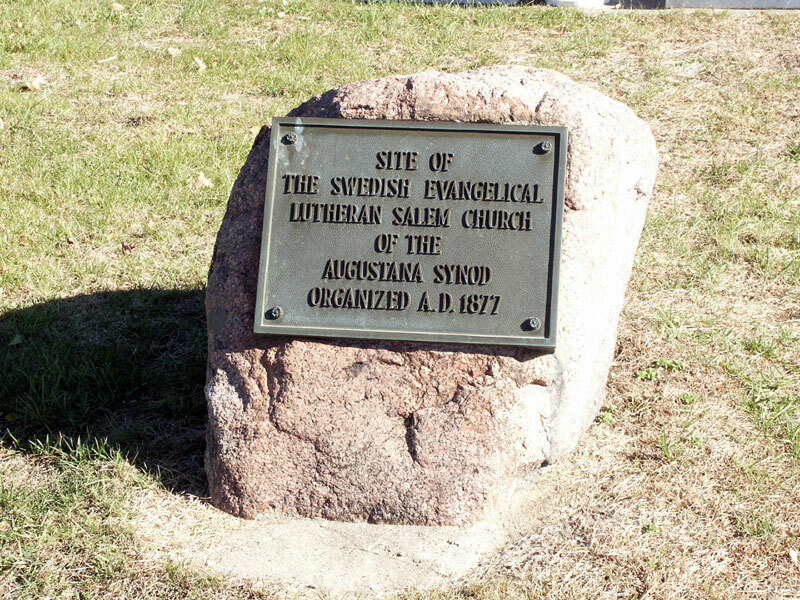 The remains were laid at rest in the cemetery at the Swedish Lutheran church in Farmington, Sunday Aug. 12, in the presence of friends and relatives, Rev. C. A. Rosander, pastor of the church officiating. 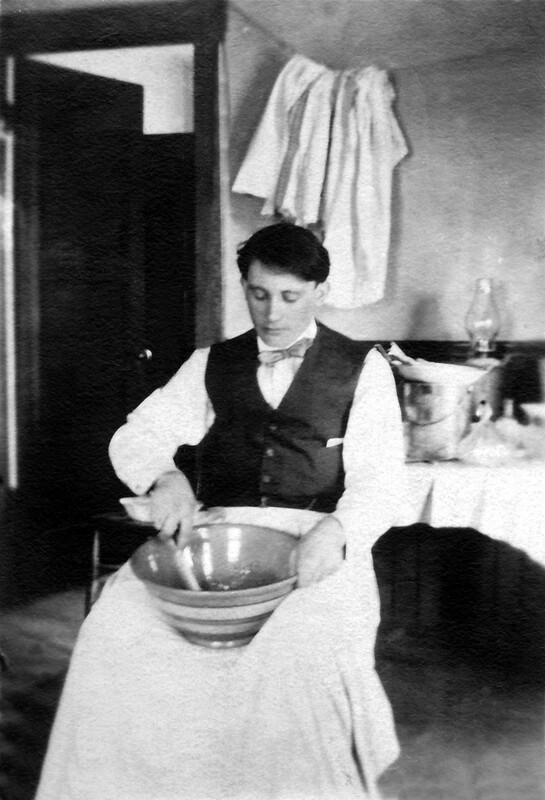 Almo Larson cooking at the Larson farm, about 1914. 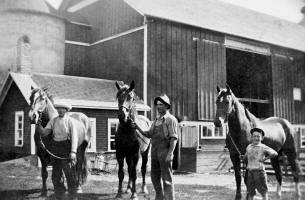 Olaus, Almo and Wilbur Larson at the Larson farm, about 1920. This is one of the last known pictures of Olaus Larson, who died November 11, 1920. Enclosed herewith is a letter from Cousin Oscar and Olga in Chicago. I wrote Oscar asking him for information on mother’s side of the family so here it is. Some facts about mother’s family I was not familiar with. Mother lived to the age of 58 years , However, the last few years of her life she suffered (patiently) Rheumatism which compelled her to be confined to bed much of the time. Always cheerful enduring pain with patience. A living SAINT. I, Arthur D. Larson, am feeling good. Last evening the Waupaca Red Cross Chapter held their annual meeting and I resigned as Chapter Chairman. I had selected a very capable man to be my successor and he was voted in unanimously by the Chapter. I had held the office 4 years, and am still a board member and Disaster Chairman. Almo and Emma drove to Dodgeville yesterday. Her sister Maude has been at Almo's a few days but the care was too much for Emma so now one of the sons at Dodgeville is going to try his mercy luck. For her sake I hope it will last. Say Bob, when you have completed your GENEALOGY you may jot me down as a customer. It will be fun to read about the people we descended from. All for now, be good to yourselves and sleep tight every night. My typewriter runs ahead of my finger touch. Lots of love to the whole family; even the pooch. This is the Genealogy of the family on father’s sides. Grandfather, Lars Person Died in Sweden 1886. Grandmother, Christina Olsdotter Died in Sweden 1856 (Lars Person’s first wife). First family: 7 boys, viz. Aaron died as an infant, Peter (Froberg); Anders; Magnus ; Gustav; Olaus; Erick. Second wife’s name Maria, no date of her death. The following are the children with this marriage: Sven; Ingrid; Christina. Peter, Anders, Magnus, Ingrid and Christina died in Sweden; Erick in Oakland Cal. ; Sven in Miles City, Montana. 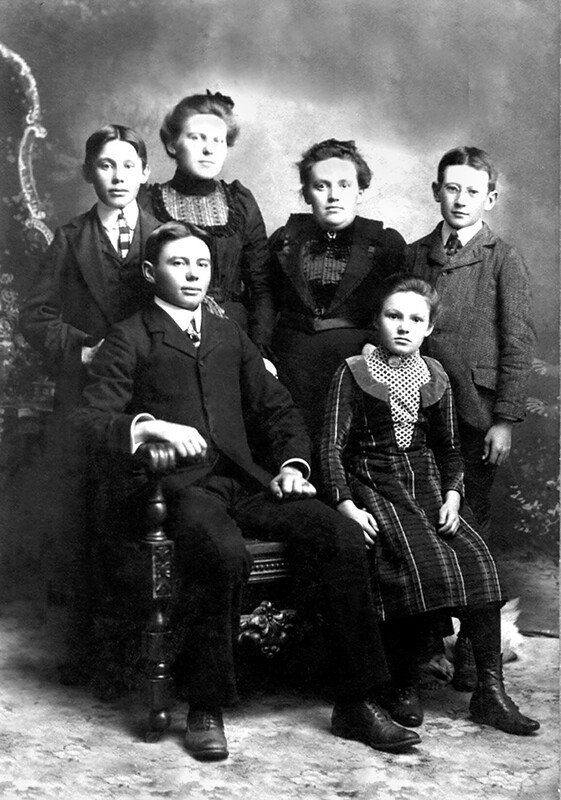 Olaus and Gustav in Waupaca Wis.
Peter (Froberg) family; 3 girls (names not available) and 2 boys (Joseph and Gustav); all lived in Karlskrona, Sweden. Anders: wife’s name: Anna Karen; Children: Helena, age 96, lives in Stockholm Sweden. Christina, age 92, lives in Neshkoro, Wis. Amanda, age 82 and Matilda, age 86, live in Sweden. Magnus: wife’s name unknown; Children: Karl; Emma; August and Erick. Karl and Emma live in Sweden, Erick in Mpls. Minn. August, single, died in Boyceville, Wis. where he owned a farm. 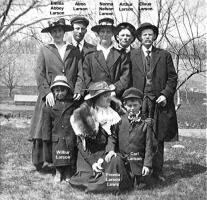 Gustav: wife's name: Juliana; Children, Albert, deceased in Waupaca; Edith; Ed; Elmer; Henry; Clara - living; Ruben; Phillip. Ed died in Bismark N.D. Elmer and Henry died in Tacoma, Wash.
Sven "Freeberg" died in Miles City, Mont., wife's name not available. Children viz. Alma deceased in Seattle Wash. Oscar deceased same city. Albert lives in Missoula, Mont. Gladys in Seattle and three others believed to be deceased. 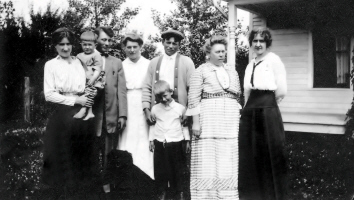 Ingred and Christine (half sisters of my father Olaus Larson); one of these sisters is the mother of the Hawkinsons who came to Minneapolis from Sweden. If I recall correctly Freeda visited at the Hawkinsons in Minneapolis. Two years ago I called on Carl in a Rest Home in Oakland, California. He died shortly after from Cancer. Elof died in Mpls. Alfred still lives there. Others: unknown. Erick Larson: Wife and 2 children names unknown. Lived in Oakland, California. Olaus Larson: born April 23, 1851, Kalmar Lan, Smoland, Sweden. Deceased Nov 11, 1920. Wife: Catherina Olivia Wilhelmina, born Jan. 25, 1848, in Östergotland, Sweden; died Aug. 6, 1906. Married in Marquette Mich., 1874. 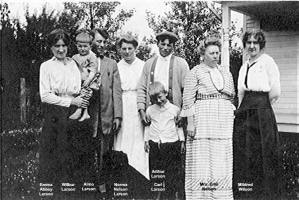 Following are the children: Emily born Dec. 21 1875, in Sacramento, Cal. ; Emil born Aug. 15, 1878 (same place as Emily). Emily (Mrs. Johnson) died Aug 5, 1905 in Town of Farmington. Emil died in same Township July, 1892. Arthur born Jan. 21, 1881; Edith born Feb. 8, 1883. 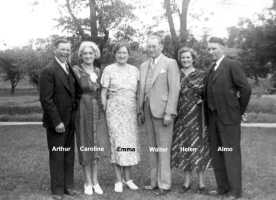 Almo born June 29, 1885; Walter born June 6,1888; Freeda born Sept 30, 1891. Walter passed away in Washington, D.C. July 5th, 1961. 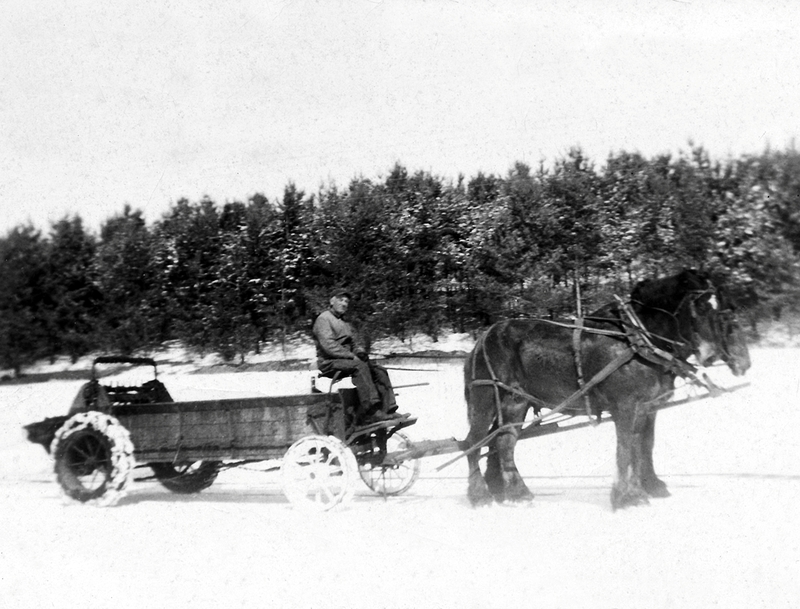 Father came to this country in 1872 and landed in Marquette, Michigan where he found employment with a Railroad Co. I do not know the exact year mother came to this country. However, it evidently was about the same year father arrived, although they never met until after arriving in Marquette, Mich. In 1875 there was a money shortage in Michigan. Father said the laborers were paid off with a purchase order on the Company's store. This system he did not like, so he corresponded with his brother Erick who was working in California and said the times were good out there. 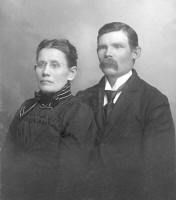 In 1875 Father left mother in Marquette and went to California to find a home for his wife and expected child. He hired out to a company of woodsmen operating in the foothills out some distance from Sacramento. Here they were when Emily was born. I recall mother telling about the many, many hours of labor pains she had to endure until father scouted around until he found a woman who was a mother with some experience in childbirth. She came to mother’s assistance and in a short time the baby was born and all were happy. I can't recall that my parents ever told how long it took each one of them to travel from Michigan to California. 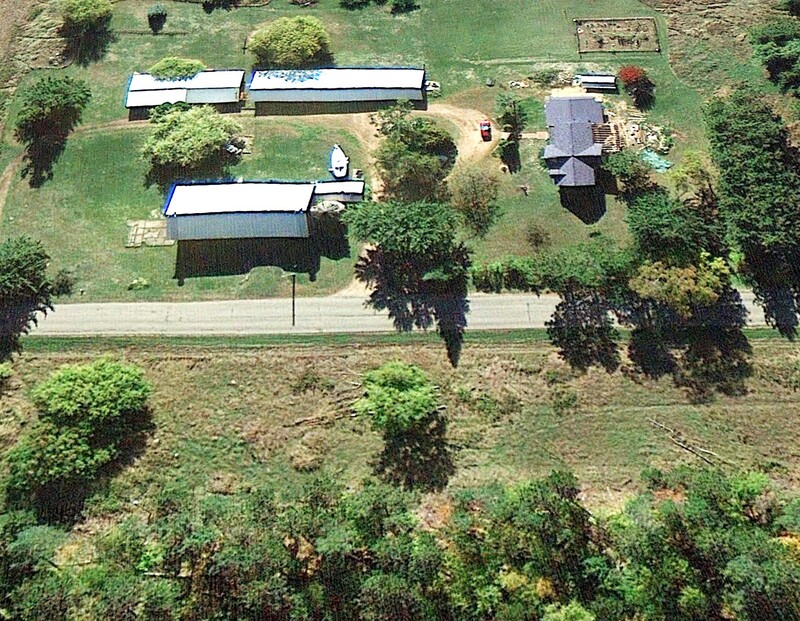 However, coming from there to Waupaca with 2 lively youngsters and mother 7 months pregnant was not all pleasure; still they made it and shortly after arrival they bought an 80 acre farm with 15 acres under cultivation, a small frame house 12x14x20 and a shack 12x12 (not occupied) where my parents had to occupy because the people who had purchased this farm from Mrs. Hunt had the privilege to live in the larger house until April 1st. So yours, Arthur D., was born in that 12x12 Mansion. Father used this building for a granary a few years. Moses Hunt was born November 9, 1795, in Jaffrey, Cheshire Co., NH, and died May 22, 1880, in Farmington Twp., Waupaca Co., WI, at age 84. Buried in St. Patrick Cemetery, Northport, Lebanon Twp., Waupaca Co., WI. 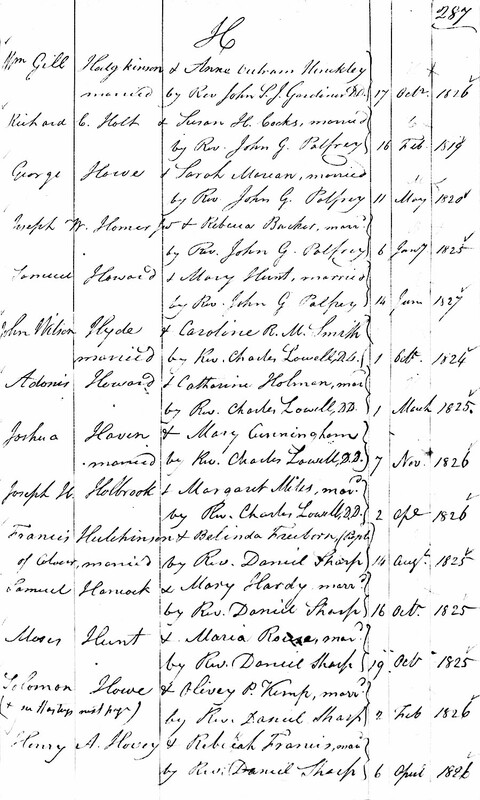 Moses is the son of Nathan Hunt of Acton, MA, and Abigail Hale of Rindge, Cheshire Co., NH. Georg Frohner was born about 1814 in Germany, and died Unknown. At age 40 he immigrated to the United States, arriving at the Port of New York August 15, 1854..
Michael Frohner was born September 14, 1838, in Baden, Germany; was Christened September 18, 1838, in Hemsback a/d Bergstraße (A. Weimheim), Baden, Germany; and died Unknown. He is the son of Georg Froehner, and Margaretha Leonhard of Unknown. Maria Anna Fink was born February 16, 1825, in Laudenbach, Germany; was Christened February 17, 1825, in Laudenbach, Germany, and died February 11, 1910, in the City of Waupaca, Waupaca Twp., Waupaca Co., WI, at age 84. Buried in St. Mary Magdalene Parish Cemetery, Waupaca, Waupaca Co., WI. She is the daughter of Georgius Fink, and Margaretha Kraus. Adam Froehner was born April 8, 1848, in Germany; was Christened April 16, 1848, in Hemsback a/d Bergstraße (A. Weimheim), Baden, Germany; and died Unknown. He is the son of Georg Froehner, and Maria Anna Fink. Moses Hunt and Maria Rouse were married October 19, 1825, in Boston, Suffolk Co., MA. Moses Hunt and Maria Rouse Marriage Record. The 1850 U. S. Census taken on August 23, 1850, shows Moses Hunt (age 55) born in New Hampshire, is a Policeman, and is living in the 5th Ward, City of New York, New York Co., NY. Living with him are: Maria Hunt (age 44) born in Massachusetts; his son, John E. Hunt (age 22) born in Massachusetts; his daughter, Elizabeth Hunt (age 18) born in New Hampshire; his son, Moses Hunt (age 13) born in Massachusetts; his daughter, Abby A. Hunt (age 7) born in New York; and his son, Henry C. Hunt (age 5) born in New York. 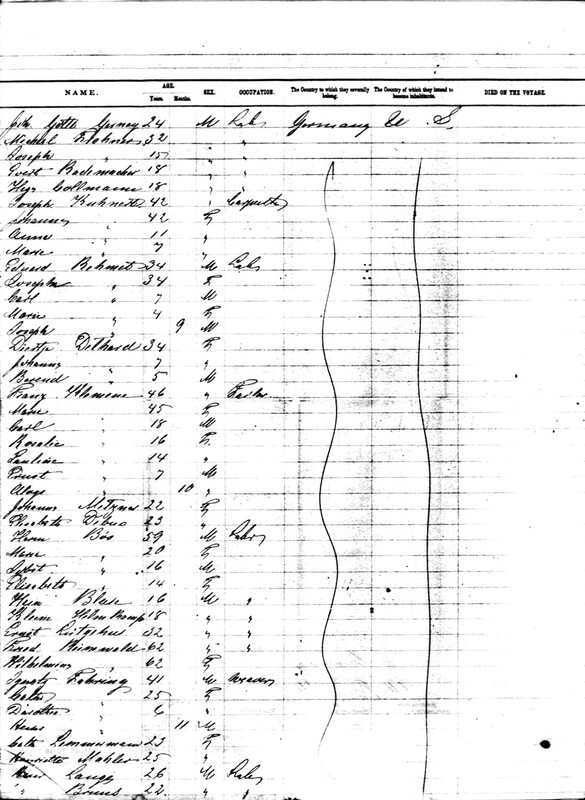 The 1855 New York State Census taken on June 21, 1855, shows Moses Hunt (age 59) born in New Hampshire, is a married Policeman, and is living in a brick home worth $5,000 and is living in the 5th Ward, City of New York, New York Co., NY. 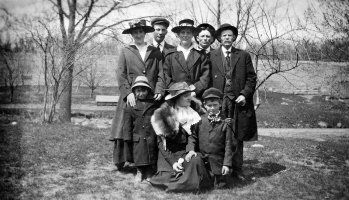 Living with him are: his wife, Maria Hunt (age 52) born in Massachusetts; his married son, John E. Hunt (age 24) born in Massachusetts, a Clerk; his unmarried son, Moses Hunt (age 18) born in Massachusetts, a Clerk; his daughter, Amanda Hunt (age 12) born in New York; his son, Henry C. Hunt (age 10) born in New York; his married son-in-law, Willm. B. Rabineau (age 24) born in New York, who works in Baths; his married daughter, Elizabeth Rabineau (age 22) born in New Hampshire; and his granddaughter, Ida M. Rabineau (age 3) born in New Jersey. The 1860 U. S. Census taken on July 12, 1860, shows Moses Hunt (age 66) born in New Hampshire, and with personal estate of $100 is a Policeman, and is living in the 8th Ward, City of New York, New York Co., NY. 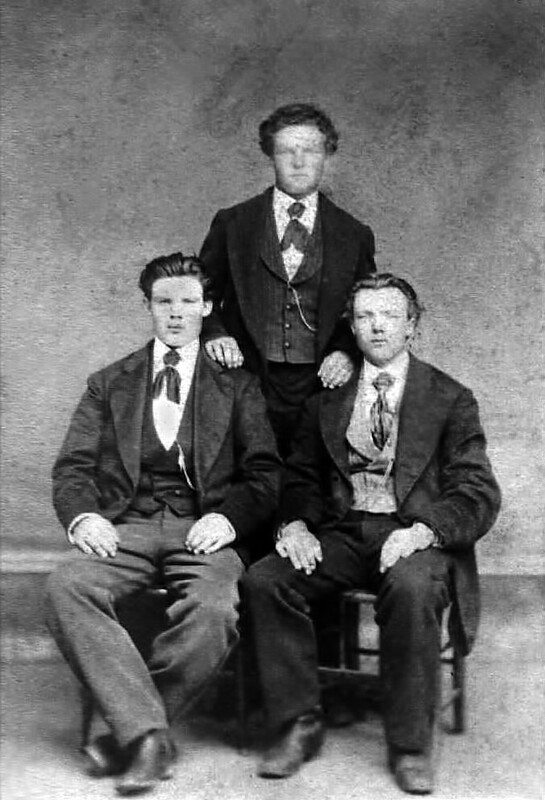 Living with him are: Martha Hunt (age 56) born in Massachusetts; Michael Hunt (age 26) born in Massachusetts; and Henry E. Hunt (age 15) born in New York. Maria Anna "Mary" (Fink) Frohner (age 27) born in Baden, departed Le Havre, France, aboard SS Admiral, and arrived March 19, 1861, at the Port of New York, NY. Maria Anna "Mary" (Fink) Frohner 1861 Immigration Record. The 1870 U. S. Census taken on July 12, 1870, shows Moses Hunt (age 74) born in New Hampshire, and with real estate of $1,200 and personal estate of $300 is a Farmer, and is living in Farmington Twp., Waupaca Co., WI. Living with him is Mary Hunt (age 38) born in Baden, who is Keeping House. The 1870 U. S. Census taken on January 10, 1870, shows Maria Hunt (age 65) born in Massachusetts, and is living at the Paiges Hotel, Spring Street, 8th Ward, City of New York, New York Co., NY. Joseph Michael Frohner (age 15) born in Germany, arrived 1871, at the Port of New York, NY. 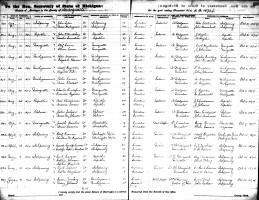 Joseph Michael Frohner 1871 Immigration Record. 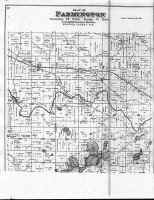 The 1874 map of Farmington Twp., Waupaca Co., WI, shows M. Hunt owns 80 acres of land, located at the last "N" in FARMINGTON. 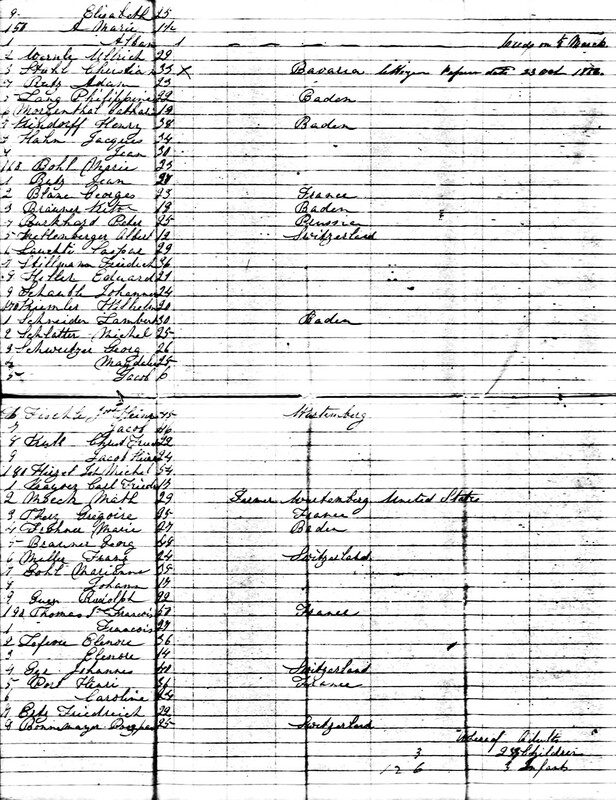 The 1875 Wisconsin State Census shows One White Male and one white female are living in the Moses Hunt residence in Farmington Twp., Waupaca Co., WI. The 1880 U. S. Census taken on June 15, 1880, shows Mary Hunt (age 49) born in Germany to German-born parents, is a widow, and is living in Farmington Twp., Waupaca Co., WI. Leigh Larson note: This is on the 40 acre land located to the east of the original Moses Hunt land. 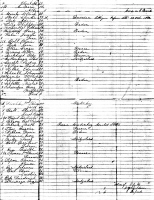 The 1880 U. S. Census taken on June 7, 1880, shows Jos. Freenor (age 24) born in Baden to Baden-born parents, is a Farmer and is living in Carson Twp., Portage Co., WI. Living with him are: his wife, Elle Freenor (age 21) born in Canada to Canadian-born parents, who is Keeping House; son Francis Freenor (age 1) born in Wisconsin to Baden and Canadian-born parents; and his unmarried uncle, Michael Freenor (age 40) born in Baden to Baden-born parents, who Works on Farm. Moses Hunt died May 22, 1880, in Farmington Twp., Waupaca Co., WI, at age 84. Buried in St. Patrick Cemetery, Northport, Lebanon Twp., Waupaca Co., WI. The 1880 U. S. Census taken on June 7, 1880, shows Maria Hunt (age 76) born in Massachusetts to Massachusetts-born parents, is a widowed or divorced Housekeeper, and is living at 301 West Street, New York City, New York Co., NY, a Housekeeper. Maria (Rouse) Hunt died November 26, 1882, in Manhattan, New York City, NY, at age 77. Buried in Green-Wood Cemetery, Brooklyn, Kings Co., NY. Moses Hunt was born November 9, 1795 in Jaffrey, Cheshire Co., NH, and died May 22, 1880, in Farmington Twp., Waupaca Co., WI, at age 84. Buried in St. Patrick Cemetery, Northport, Lebanon Twp., Waupaca Co., WI. Moses is the son of Nathan Hunt of Acton, MA, and Abigail Hale of Rindge, Cheshire Co., NH. Nathan2 Hunt (Simon1) was born on 17 July 1760 in Acton, Middlesex County, Massachusetts. He married Abigail Hale, daughter of Moses Hale and Abigail Emerson, in 1787. He died on 18 July 1853 at age 93. Abigail Hale was born on 1 February 1768 in Rindge, Cheshire County, New Hampshire. i. Abigail3 Hunt was born in November 1788. She married Reuben Streeter. She married Jonathan Webster. ii. Nathan Hunt was born on 17 April 1791. He married Violentia Hodgman on 10 January 1814.
iii. Grata Hunt was born on 26 June 1793. She married Benjamin Cutter on 9 September 1819. She died on 5 November 1871 at age 78.
iv. Moses Hunt was born on 9 November 1795. He married Maria Rouse on 19 October 1825.
v. Harriet Hunt was born on 1 June 1798. She married Ezra Bennett. vi. Sally Hunt was born on 3 September 1800. She married David French. vii. Fanny Hunt was born on 3 December 1802. She married William H. Salisbury. viii. John Edwards Hunt was born between 9 November 1805 and 24 November 1805. He married Elizabeth White. He married (--?--) (--?--). He married (--?--) (--?--). ix. Elvira Hunt was born on 24 March 1808. She married George A. Willard. x. Raymond Hunt was born on 18 May 1810. He married Maria A. Chapman on 25 November 1828. Our readers have been treated to more or less petitions of late in regard to a “street alleged to have been laid out in 1855 in the 1st ward” in fact that said street has been up and down before the Council ever since March 1885, but it has never materialized very far toward a street as yet. The facts in the case, are that for the past quarter of a century or more there has been a road or several forks of them meandering from the Brainard Bridge around Mr. W. Scott’s land to the Mortensen (or old Blinn place) and to connect with the road near Mrs. Hunts’ place in Farmington. 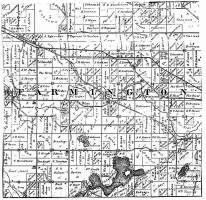 By a petition of W. Scott and others in 1885 a road was finally established and fences built running westward from the Brainard Bridge taking two rods from Alice Brainard’s land and two rods from W. Scott’s land, to the town line of Farmington, to Henry Mortensen’s place. Nothing was done about making the new road until 1887. ‘88 the Council verbally let some party cut off the timber for the wood on the said street. 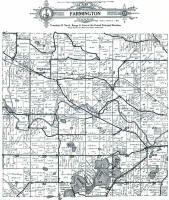 In 1889 the town board of Farmington and the City Council jointly laid out a highway to intersect the west end of this alleged highway as above noted running northward on the town line between Waupaca and Farmington to intersect the highway near Mrs. Hunt’s land. It seems after the timber was cut off it revealed a good sized stone quarry on that highway for twenty rods or more so there has been no street Committee imbued with sand enough to go ahead and attempt to work a road through it. The old road has served the only means for travel to the Mortensen farm. This year Mr. Mortensen got tired of traveling to the city with the old highway obstructed with gates nailed up, so petitioned earnestly and often to the city to work the road laid in 1885 and give him an outlet. 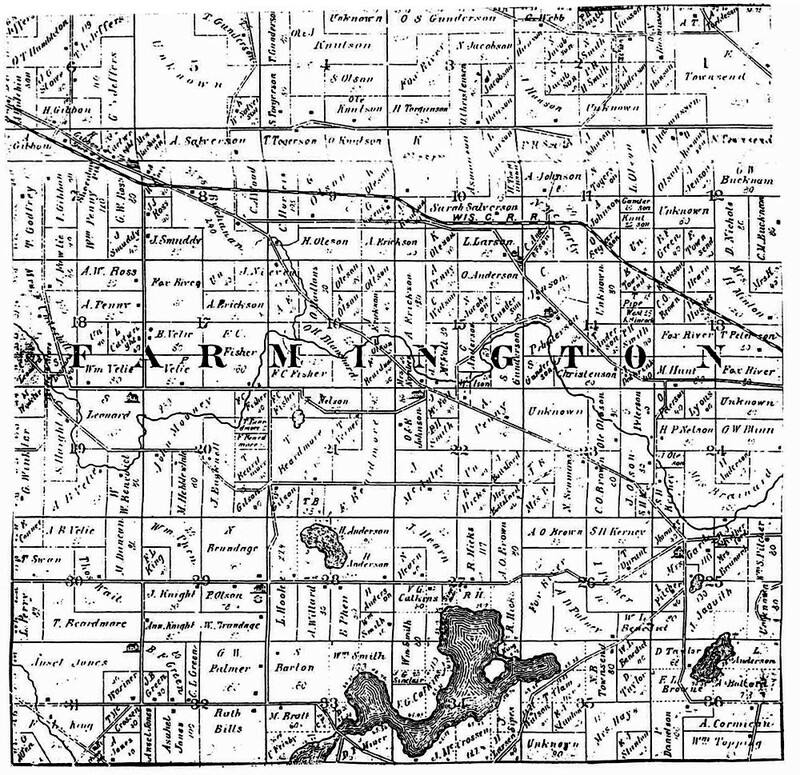 Mr. McFall as Chairman of Farmington joined in the song and dance and threatened to bring action to compel the city to “open sesame” the byways and hedges in that direction. But the present Council felt that there was not money enough in the treasury to open a stone quarry this year. In the controversy the records were searched and it was found that the law had not been complied with nor the record of the action of the jury entered in laying out the said street, so the council decided that inasmuch as the law had not been complied with they had no legal rights in the premises; they voted that the Mayor get legal advice upon the matter, which he did of Henry D. Ryan city attorney of Appleton, who holds that the old road is the only legal highway and that the street supposed to have been (incomplete article). The 1889 map of Farmington Twp., Waupaca Co., WI shows O. Larson owns the 80 acres of land that M. Hunt owned in 1874, and that Mrs. Hunt owns 40 acres of land, located east of the 80 acre plat, separated by another owner (Fox River?). Please note the ownership of 80 acres of land to the north of the Olaus Larson land is owned by U. S.
The 1895 Wisconsin State Census taken on June 20, 1895 shows Mrs. Hunt born in Germany is a white female living alone in the City of Waupaca, Waupaca Co., WI. The 1900 U. S. Census taken on June 1, 1900 shows Mary Hunt (age 69) born April 1831 in Germany to German-born parents and having emigrated in 1861 with the only child born to her still living is a widowed Landlord owning her home without a mortgage on Grant Street, 1st Ward, City of Waupaca, Waupaca Twp., Waupaca Co., WI. The 1901 map of Farmington Twp., Waupaca Co., WI shows O. Larson owns the 80 acres of land that M. Hunt owned in 1874, plus the 40 acres he purchased as a Land Patent. 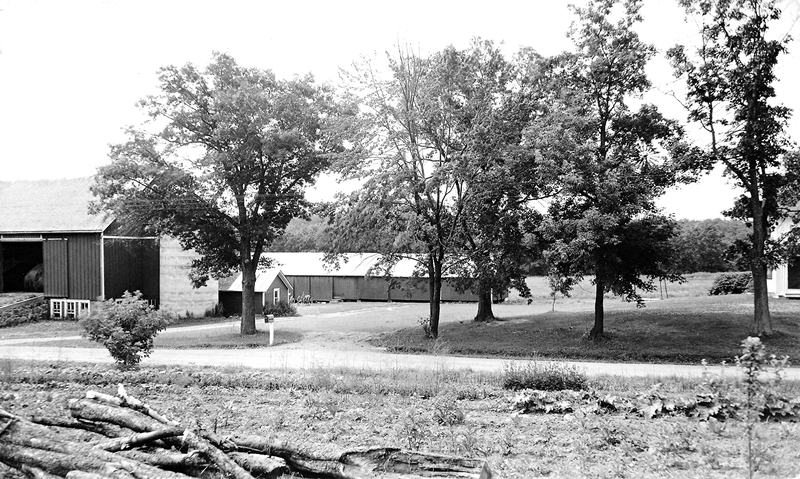 The 40 acres owned by Mrs. Hunt, located east of the 80 acre plat, separated by another owner, is now owned by E. Larson. 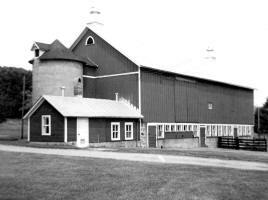 Arthur Larson owns 80 acres of land south of Sheridan. The 1905 Wisconsin State Census taken on June 1, 1905 shows Olaus Larson (age 54) born in Sweden to Swedish-born parents is a married Farmer who owns his farm free of a mortgage, and is living in Farmington Twp., Waupaca Co., WI. Living with him are: his wife, Katharin O. Larson (age 57) born in Sweden to Swedish-born parents; his unmarried daughter, Edith C. Larson (age 22) born in Wisconsin to Swedish-born parents, who does Housekeeping; his unmarried son, Elmer Larson (age 19) born in Wisconsin to Swedish-born parents, a Farm Laborer; his unmarried son, Walter E. Larson (age 17) born in Wisconsin to Swedish-born parents, a Farm Laborer; his unmarried daughter, Freeda W. Larson (age 13) born in Wisconsin to Swedish-born parents; his granddaughter, Myrtle Larson (age 3) born in Illinois to Illinois and Wisconsin-born parents; his granddaughter, Hazel Larson (age 2) born in Illinois to Illinois and Wisconsin-born parents; and his grandson, Paul E. Larson (age 4/12) born in Illinois to Illinois and Wisconsin-born parents. 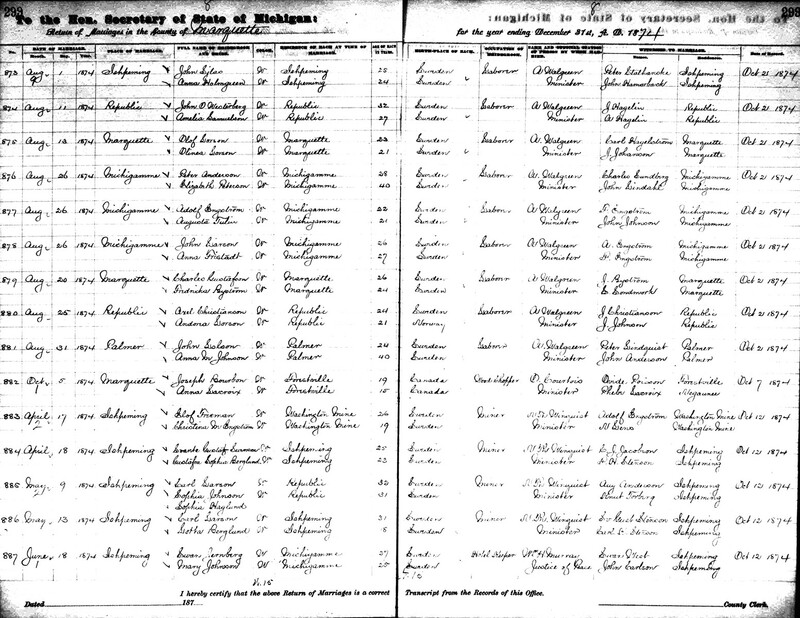 The 1905 Wisconsin State Census taken on June 1, 1905 shows Mary Hunt (age 74) born in Germany to German-born parents is a widowed Capitalist owning her own home free of a mortgage and living alone in the City of Waupaca, Waupaca Co., WI. 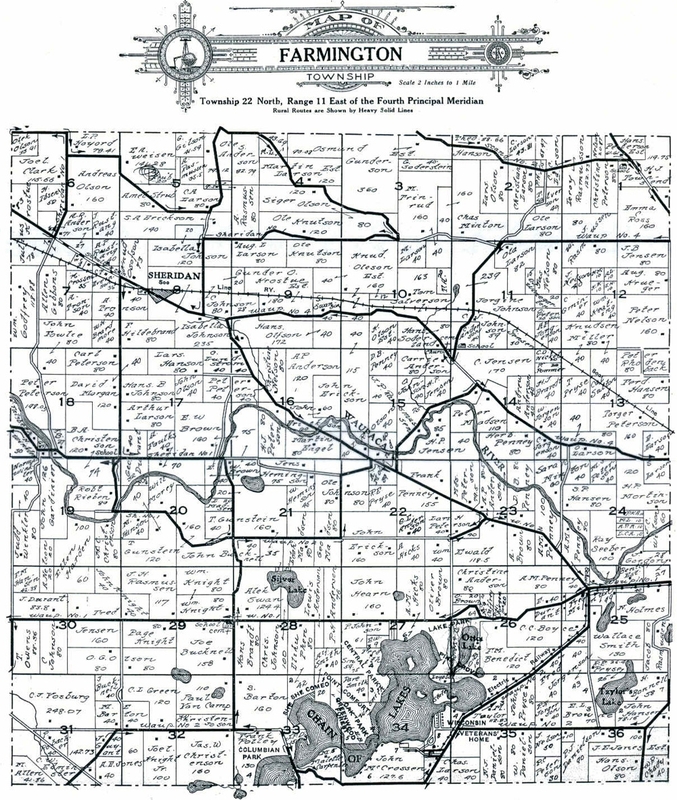 The 1912 map of Farmington Twp., Waupaca Co., WI shows O. Larson owns the 80 acres of land that M. Hunt owned in 1874, plus the 40 acres he purchased as a Land Patent. 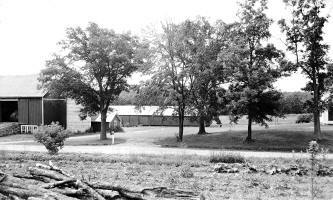 The 40 acres owned by Mrs. Hunt, located east of the 80 acre plat, separated by another owner, is now owned by E. Larson. 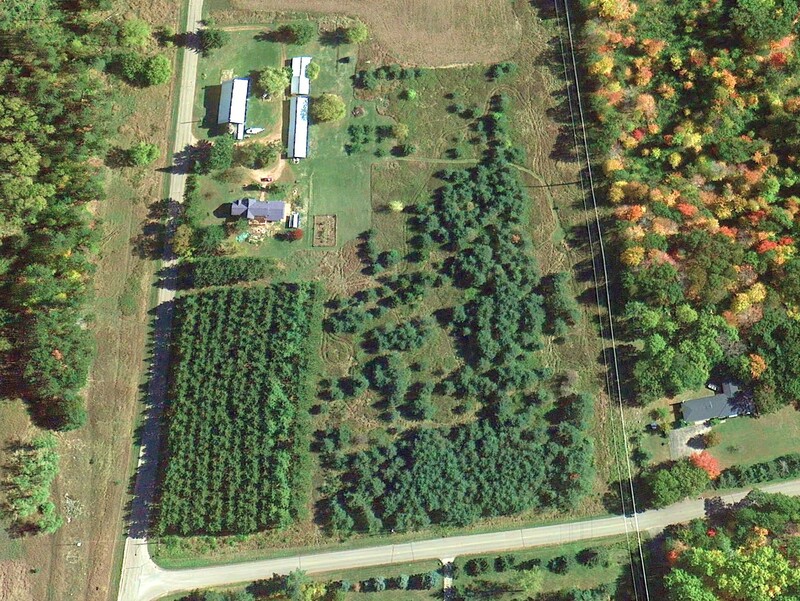 Arthur Larson owns 80 acres of land south of Sheridan. Mary (Fink) (Freenor) Hunt died February 11, 1910, in the City of Waupaca, Waupaca Twp., Waupaca Co., WI, at age 78. Buried in St. Mary Magdalene Parish Cemetery, Waupaca, Waupaca Co., WI, Waupaca. Services at St. Mary's Catholic Church. Maria Anna Fink was born February 16, 1825, in Laudenbach, Germany; was Christened February 17, 1825, in Laudenbach, Germany, and died February 11, 1910, in the City of Waupaca, Waupaca Twp., Waupaca Co., WI, at age 78. Buried in St. Mary Magdalene Parish Cemetery, Waupaca, Waupaca Co., WI. She is the daughter of Georgius Fink, and Margaretha Kraus. Mary (Fink) (Frohner/Freenor) Hunt died February 11, 1910, in the City of Waupaca, Waupaca Twp., Waupaca Co., WI, at age 78. Buried in St. Mary Magdalene Parish Cemetery, Waupaca, Waupaca Co., WI. Mother of Conductor Joseph Freener Dies in Want Amid Riches. Mrs. Mary Hunt, mother of Joseph Freener, a Soo line conductor well known in this city, died at her home in Waupaca on Feb. 11, aged 78 years. Many years ago, as the result of an estrangement between herself and son, she forbade him coming to the house and for over 20 years he had not even seen her. Since the death of her husband several years ago, no other person has ever been known to enter the house. She lived in a handsome home but never used any part of the house except the kitchen, which served as a sleeping room as well as all her other purposes. All the blinds were always kept closed and not a ray of sunlight had penetrated the house in years. She still retained her antiquated dresses and whenever she appeared on the street, which was seldom, she still wore the old hoop skirt and seemed utterly oblivious to the curiosity her appearance aroused. The day before her death the neighbors became alarmed because she had not been seen outside the house and there was no smoke from the chimney. They entered the house and found her ill in bed with no fire and no food in the house. Upwards of $3,000 in cash and bonds were found in an old pail in the sink and an $800 mortgage was picked up from the rubbish on the floor. Nearly $4,000 in cash, mortgages and bonds were found in the house. Her son and his wife, who now reside in Fond du Lac, responded at once to the message announcing his mother's illness and took charge of affairs. She was buried on Monday from St. Mary's Catholic church, Father Mortell officiating. Mother of Well Known Engineer on the Soo Dies at Waupaca, Leaving Much Wealth. Engineer Jos. Freenor, of Fond du Lac, is among the pioneer employes of the Central, now Soo, company. 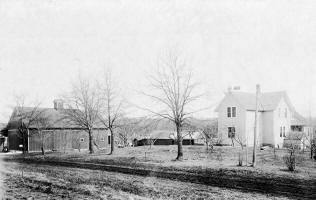 For several years when a young man Stevens Point was his home, and he was married here. The following, relative to the death of his mother, which is taken from the Waupaca Record, will therefore be of interest to a number of our readers: Mrs. Mary Hunt, one of Waupaca's most unique characters, passed away on Friday, at the age of seventy-eight years. She was found by her neighbors in an unconscious condition on Thursday morning and had evidently been ill several days. She lived alone in one room of a large house on Granite street and it is supposed to have been years since any human being entered the house but herself. The shutters on the house were all closed and not a ray of sunlight has penetrated the residence in years. About $3,600 in money and bonds were found lying about the house in different places, most of it in the kitchen sink in an old tin pail and stocking. The kitchen served her for sleeping-room, parlor, dining room and kitchen, and she retained the style of dress of the olden day even to the hoop skirt. Whenever she came down town the curious eyes of the public were turned upon her and she seemed very indifferent to the interest she created. Her husband died several years ago and she is survived by one son, Francis Joseph Freenor, who with his wife and family were present at the funeral. She became estranged from her son many years ago and forbade his coming home. He resides in Fond du Lac and is an engineer on the Soo line and his run has brought him through Waupaca daily, but he has not seen his mother in almost twenty years. The funeral was held from St. Mary's church on Monday morning at 9 o'clock, Father Mortell officiating, with interment in the Lakeside cemetery. Leigh Larson comments: Strange that Mary Freenor immigrated in 1861, yet her son Francis Joseph Freenor did not immigrate until 1870. 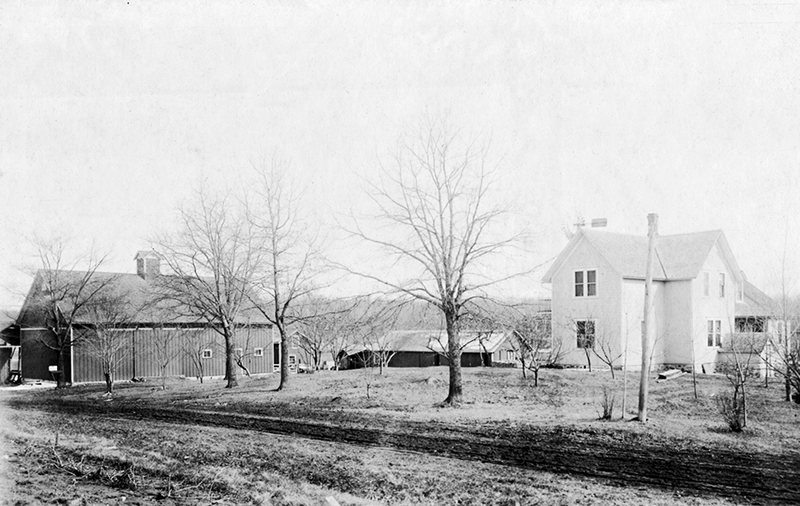 By 1870, Mary had already married a New York City policeman, Moses Hunt, who was probably recently divorced, and they moved to a farm in rural Waupaca. 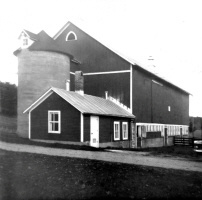 By 1880, Francis Joseph Freenor is married, and farming in rural Portage Co., WI. His uncle Michael Freenor also lives there, so it is likely that Francis emigrated with his uncle, not with his mother. The 1910 U. S. Census taken on April 21, 1910 shows Joseph F. Freenor (age 54) born in Germany to German-born parents and having emigrated in 1870 and a naturalized citizen is a Locomotive Engineer Landlord owning his home without a mortgage at 82 West Division Street, 4th Ward, City of Fond du Lac, Fond du Lac Co., WI. Living with him is his wife of 33 years, Nellie Freenor (age 51) born in Massachusetts to Canadian (French) and Massachusetts-born parents, with 6 of the 10 children born to her still living. Living at home are: their unmarried daughter, Susie Freenor (age 16) born in Wisconsin to German and Massachusetts-born parents; and uncle Michael Freenor (age 72) born in Germany to German-born parents, who has his Own Income. Joseph F. Froehner was born March 15, 1856, in Baden, and was Christened March 17, 1856, in HEILIG GEIST KATHOLISCH, HEIDELBERG, HEIDELBERG, BADEN, and died December, 1917, in Fond du Lac, Fond du Lac Co., WI, at age 61. He is the son of Georg Frohner, and Anna Maria Fink of Unknown. His grandparents are Georg Froehner, and Margaretha Leonhard. Joseph Francis Freenor, aged 61, a well known Soo line passenger engineer and for several years a resident of Stevens Point, died at his home in Fond du Lac last Thursday of cancer of the liver. He was taken ill last July and since then had been off duty. He was born in Baden, Germany, March 1, 1856, and came to this country when 15 years of age. 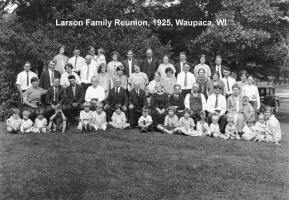 He resided with his mother at Waupaca for many years. 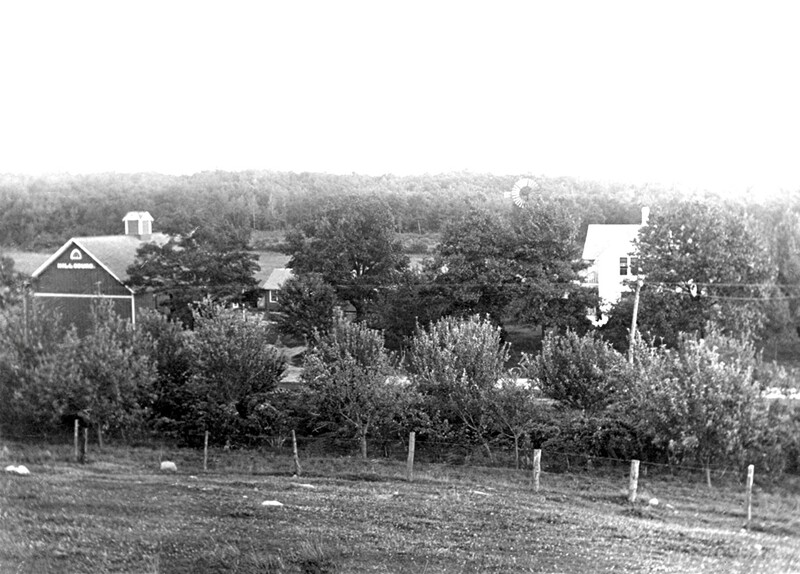 On April 7, 1877 he was married to Miss Nellie Fontaine of the town of Linwood, this county, and for several years thereafter this city was the family home. 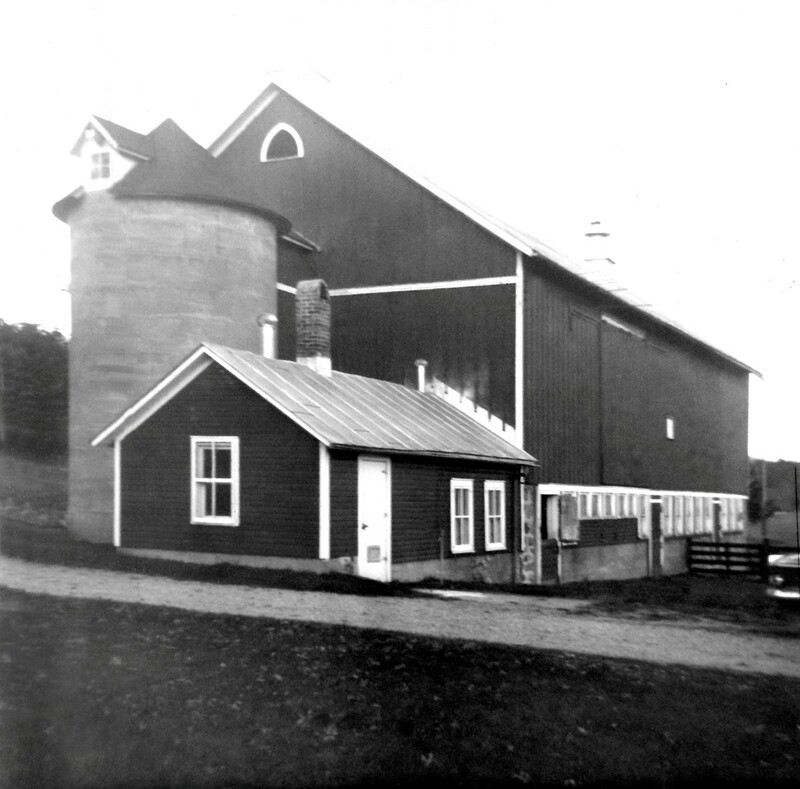 Mr. Freenor became identified with the old Wisconsin Central road in 1886 and since then made his headquarters successively at Chelsea, Waukesha and Fond du Lac, having lived in the last named city since 1901. He was well known in railroad circles. For many years he was engineer on passenger trains between Fond du Lac and Chicago. He was secretary of the Fond du Lac branch of the Brotherhood of Locomotive Engineers for 13 years and was also a member of the Knights of Columbus council there. Besides his widow, Mr. Freenor is survived by two sons and three daughters, F. J. Freenor, Dallas, Tex. ; Mrs Eric Peisker, Mrs. Schleger and John Freenor, Fond du Lac, and Mrs. Authur Faucher, Chicago. The funeral was held Monday morning from St. Louis' Catholic church at Fond du Lac. John Freenor Born November 30, 1889, in Waukesha Co., WI. Married March 19, 1910, in Waukegan, IL, to Mayme Unknown. Divorced January 25, 1917, in Fond du Lac Co., WI. Children: Joseph (age 4), Muriel (age 3), and John Jr. (age 1-1/2). 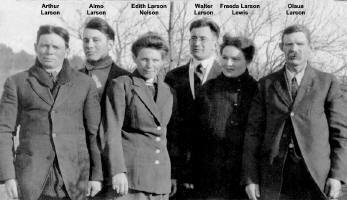 Evrard D. Freenor Born October 5, 1891 in Waukesha Co., WI. Joseph F. Freenor Born June 29, 1893 in Waukesha Co., WI. Freenor, Joseph F, engineer, r 116 College av. Freenor, Michael, bds 116 College av. Miss Pearl Freenor of Fond du Lac is soon to marry Phillip Schleiger, a Milwaukee druggist, the ceremony to be performed at Fond du Lac. From then on Freeda is familiar with the family record. Our parents are entitled to a lot of praise for raising a family of seven children on a small rocky farm, and erecting a full line of commodious farm buildings. The fruit of good planning and hard labor. Their desire was for the children to receive a good education, which they acquired at our different institutions of learning. This information was garnered from records found at the Swedish Emigrant's Haus in Vaxjo, Sweden during a visit there in August, 1995. Eva Helena Molsson was the mother of Gustava Ekman who was the mother of Catarina Olivia Wilhelmina Larsdotter. Gustava Ekman (maiden name) was born in Asby Parish in the Linköping district of Östergotland on 11 March 1825. Asby Parish is along route 131, 20 kilometers southeast of Tranas. Lars Fredrick Nilsson, the husband of Gustava Ekman and father of Catarina, was born in Grebo Parish in the Linköping district of Östergotland on 29 April 1820 and died on 24 June 1870 in Värna Parish. Grebo and Värna Parishes are along route 35, about 20 kilometers southeast of Linköping. 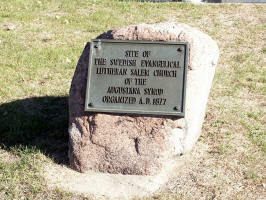 Lars and Gustava were married on 24 March 1844, at a place as yet unknown. They moved about 5 kilometers from Grebo Parish to Värna Parish in 1844. Nils Johan Alfred Larsson, eldest son of Lars and Gustava, was born 21 February 1845 and died 14 January 1849. 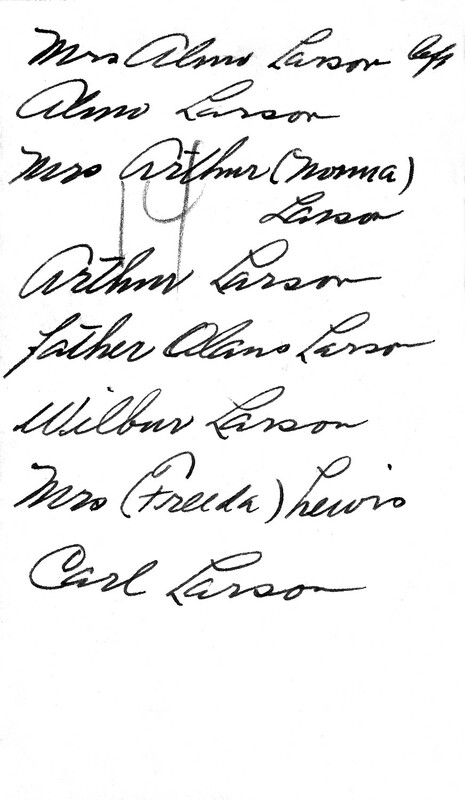 The Grebo Parish records show the death of Lars Nilsson on 24 June 1870. A line was drawn through his name. The Grebo Parish records show that Catarina left Grebo Parish in 1868 when she was 20 years old. Date of departure was not noted. A line was drawn through her name as well. Catarina moved to the Kongsvikstorp area of Värna Parish in 1868, apparently by herself. I did not write down in which household/farm she was listed. In 1872 Catarina moved from Kongsvikstorp to the Bersbo Grufna area, all within Värna Parish (page 154 of Värna records). On May 5, 1873 Catarina left Värna Parish for North America. Her name was deleted from the Parish records (page 178 of the records shows her name crossed out; she was the 75th person to depart Värna Parish in 1873). The designation pig. before her name on the records means that she was an unmarried maiden (piga). 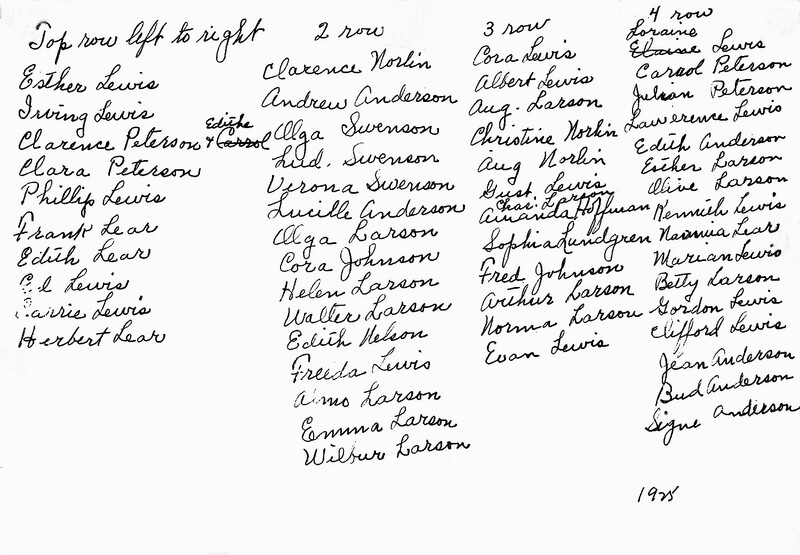 The Swedish emigration records list Gustava Ekman Larsdotter as emigrating to North America in 1883 from the Torpa Parish. Torpa is just north of Asby Parish (where she was born). The records also list her status as "widow of a farmer." This copper mine was in its peak years in the 1850s. During the years 1852-1860 seventeen houses were built to house the workers and their families. Each house contained six rooms; four on the first floor and two on the second floor. Each room had an open hearth in one corner and was to house one family. Each room measured approximately 20' by 20'. 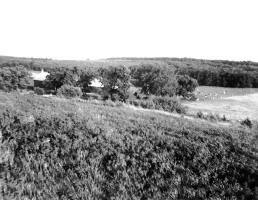 Behind each house was a long shed with six doors, providing a place for each family to stack its firewood and supplies. The mine's production began to decrease in the 1870s. In 1871 alone there were 200+ people who left the village and emigrated to North America, primarily to Michigan, to work in the mines. I have many times thought of writing a biography but as I am not an important person what use would it be, but still the thought has not left my mind. I was born in 1848 in Värna Parish in the province of Östergotland, grew up like other children and was used to going to church, learned to read morning and evening prayers, and had great ability to learn everything that was required at that time. I had a good memory and great interest in reading. When I turned eight I knew the catechism by heart. I read my bible lesson to my father every evening until I knew the catechism. I did not go to school until I was nine years old. 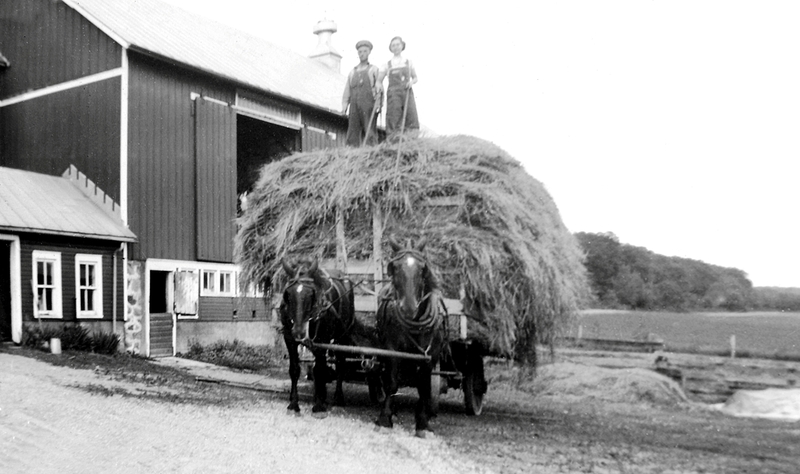 Farmers did not get much schooling in those days. I went to school five semesters, only one or two days a week. Even the pastor felt that as long as you know how to read, school was not so necessary for you. But what I have missed of education in my life I have taught myself. At the age of 15 I was Confirmed but I was not ready for God's word. I was spiritually dead. But then Count Stackelberg took over Dahla Estate and he hired a bookkeeper, set aside a room for prayer in the main building, and there accountant Johnson gave a sermon every Sunday afternoon. Then the words got meaning. I regretted my sins and I began to seek Salvation. And I remember it as if it were yesterday when our Heavenly Father first let me be aware of a longing for Salvation. I began to pray and work to get peace and I wandered in distress and darkness for a long time until one day Our Father talked to me through a hymn. Only the one who has experienced it himself knows the kind of peace that filled my soul. Now I could no longer be sad. Music filled our hearts. There was in those days the Holy Spirits Pentecostal wind going through the land. But there have been other days when I could not live on feelings when I had to cross many dark valleys. But God has not abandoned me, but He has only hidden His face from me. I know that I did not always listen to God, and I also know that if I had not gone my own way, I would have avoided many difficulties in my life. In 1873 I went to America and then there was so much that caught my interest. Being a Christian became more of a habit than a daily part of my life. One year after arriving in America I married and the following year we went to California. We stayed there five years, but then poverty came. Oh, yes, God’s love is wonderful. Only He knows how to mend a harrowed soul. Buried in Salem (Old Swede) Cemetery, Farmington Twp., Waupaca Co., WI. If there are more Swedish keywords I've forgotten to translate just let me know and I will translate them to you. I hope you will enjoy the family tree, and that I soon will hear from you.